Find out how to become a member and support community events. 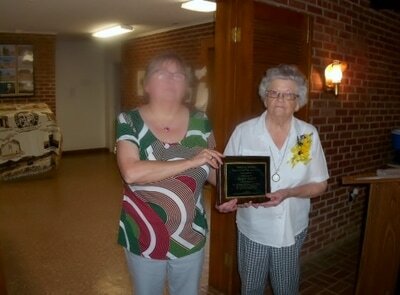 ​The Cheyenne Roger Mills Chamber of Commerce is now taking nominations for Volunteer of the Year. 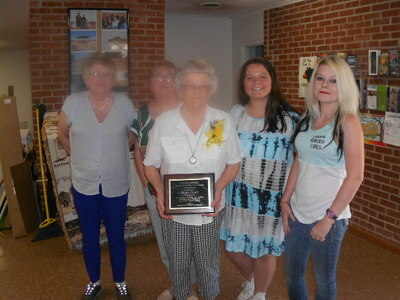 The award is given to someone who selflessly volunteers their time and service to the community or an organization. The deadline for the letters is Friday, April 26th. If you know someone you feel should be recognized, write a letter detailing your nominee's volunteer service and why you think they deserve the award. The Cheyenne Roger Mills Chamber of Commerce is proud to announce Nancy Hay as the winner of the Spend Valentine's Day in Cheyenne drawing. The prize included dinner for two at Down the Hatch, flowers from Cheyenne Floral, a box of chocolates from Cheyenne Drug, $100.00 cash from Security State Bank, $20.00 gift certificate from Johnny Mc's, a dozen Valentine's cupcakes by Christy Batchelor of Becky's Place and a free movie rental from Martin's Trading Post. All in all a great Valentine's package all right here in Cheyenne. 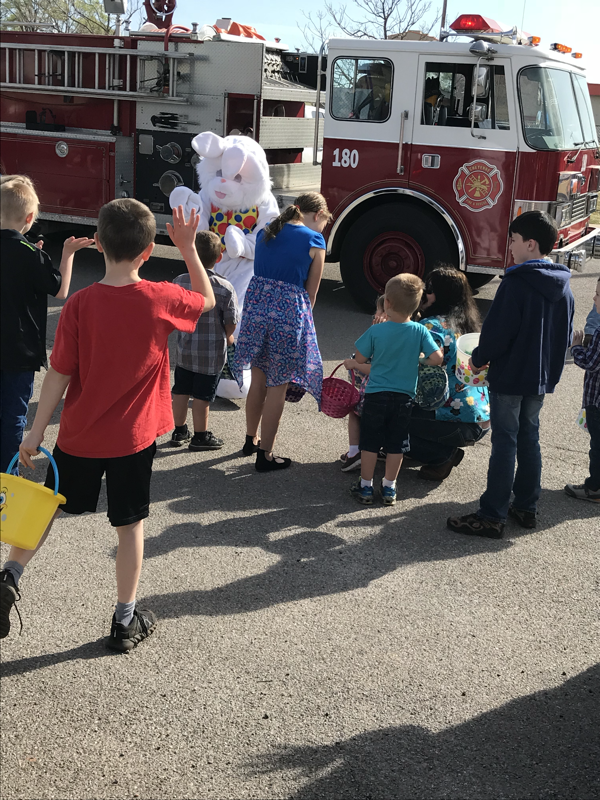 The Chamber would like to thank all donating businesses Security State Bank, Cheyenne Professional Drug, Johnny Mc's, Cheyenne Floral and Martin's Trading Post. A big thanks to everyone who bought a chance. Congratulations to Nancy! 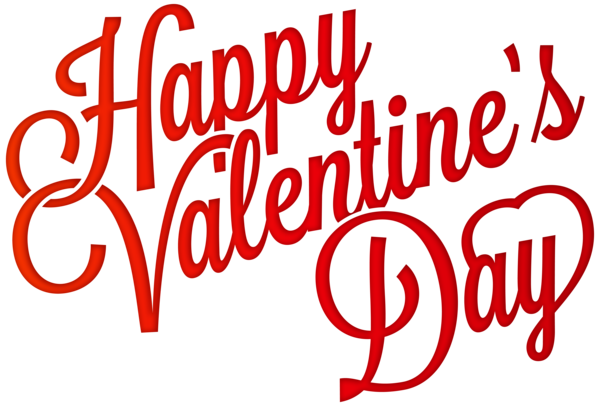 Do you think you have to leave town to have a romantic evening for Valentine's Day? The Cheyenne Roger Mills Chamber of Commerce says no! We are going to prove it to you. The Chamber is selling chances on the perfect Valentine's Day in Cheyenne. The lucky winner will receive a dinner for two at Down the Hatch where they can enjoy a bottle of wine if they so choose, a beautiful flower arrangement from Cheyenne Floral, a $20.00 gift certificate from Johnny Mc's, $100.00 cash from Security State Bank, a box of chocolates from Cheyenne Professional Drug, one dozen Valentine cupcakes from Becky's Place by Christy Batchelor and a movie rental from Martin's Trading Post. What more could you ask for the perfect Valentine's Day evening. Treat your sweetheart in style right here in Cheyenne! Chances on this great evening are $10.00 for one or 3 for $25.00. Chances can be purchased at Security State Bank from Penny Clift or Carrie Lovett, Cheyenne Drug, Roger Mills Hospital from Charolet Lucas, Roger Mills Courthouse from Jimmy Beavin, Tweed's Hilltop Cafe at Reydon, York Insurance - Jo Nell York at Durham or the Chamber of Commerce office. Don't wait get yours today. Drawing for the winner will be held Monday, February 11th. Good luck! 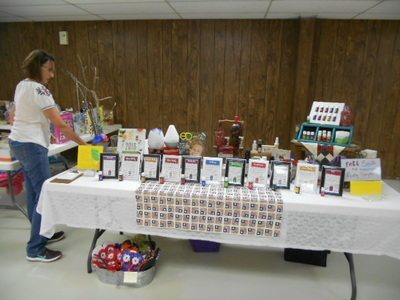 The Cheyenne Roger Mills Chamber of Commerce Annual Christmas Craft Show was held on November 17th. There were lots of great vendors with many unique items. Lots of people enjoyed the show. Dust off your favorite peach recipe and enter the Cheyenne Roger Mills Chamber of Commerce Peach Recipe Contest. The Chamber is sponsoring the peach contest at the Annual Arts and Crafts Show. The show will be held on Saturday, November 17th at the Roger Mills Ag Pavilion. Bake your peach dish and bring it to the craft show. Dishes must be checked in at the Chamber booth before noon. We request that you also submit a copy of the recipe you prepared. The dishes will be judged at 1:00 p.m. The winner will receive a $50.00 gift certificate to Market Square All the recipes will later be available for download on the Chamber website. So get ready to bake! Get ready to Shop Cheyenne on Friday, November 16th. The Second Annual Shop Cheyenne and Open House Day is fast approaching. Friday, November 16th is the day to be in Cheyenne! 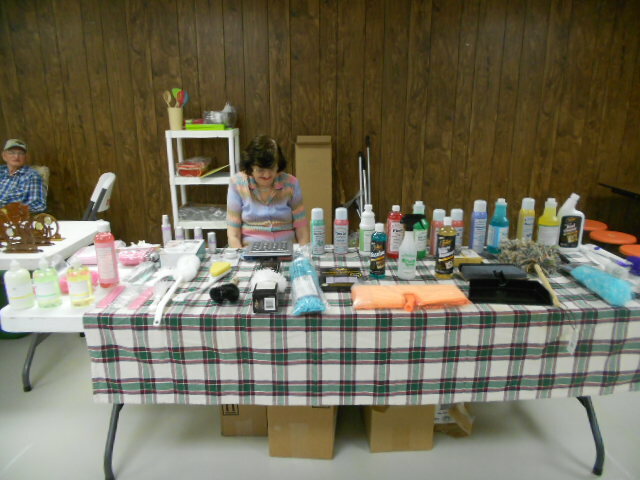 The Second Annual Shop Cheyenne and Open House Day will begin at 10:00 a.m. There will be food, prizes and lots of great shopping. Check the paper for participating businesses. The Cheyenne Roger Mills Chamber will be having a drawing for $150.00 worth of gift certificates to chamber member businesses. There will be 6 - $25.00 gift certificates in the winning package. In order to enter the Chamber drawing you must pick up a form at a participating business. Take the form to each business listed and get it signed. 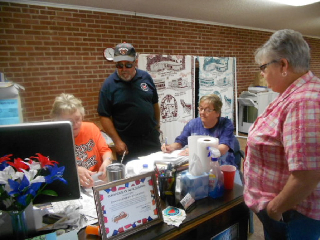 When the form is completely signed drop it in the Chamber Drawing Box at Cheyenne Drug. You do not have to be present to win. Visit The Cheyenne Roger Mills Chamber Arts and Crafts Show on Saturday, November 17th to win more packets of gift certificates. 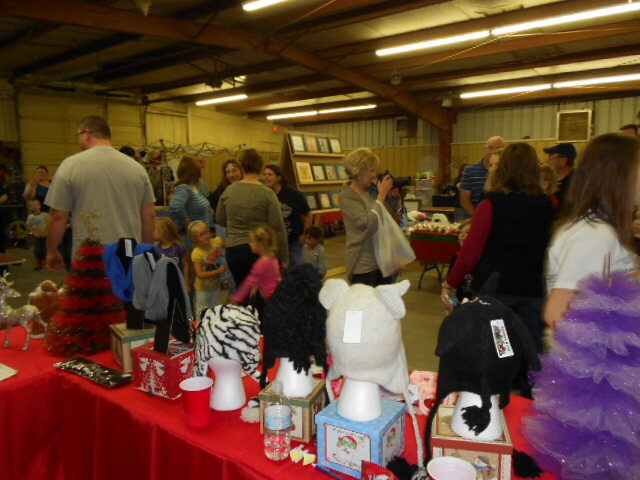 Sign up at the Craft Show for a chance to win $100.00 packet of gift certificates from chamber member businesses. There will be three packets of $100.00 given. Drawing will be held at the end of the show. You do not have to be present to win. Gift certificates will be made up from chamber businesses Smith Ag, Bear Trax, Cheyenne Floral, Cheyenne Drug, Martin's Trading Post, Johnny Mcs, Tweed's Hilltop Cafe, Washita Battlefield National Historic Site Bookstore and Market Square. There will also be hourly door prizes and Craft Cash Giveaways as well as lots of great shopping. . Don' miss it! The Cheyenne Roger Mills Chamber of Commerce hosted the Talent Show during the Draggin Main Event on Saturday, October 20th. Attendance was great for the whole event. The talent show featured some amazing contestants. Phyllis Johnson performed "Unchained Melody", Patsy Wells performed an original poem "Story of the 60's", Genia and David Blackwell performed "Blues Man", Dixie and Ashley performed "Stand By Me", Callee Lester performed "Jolene" and played guitar, Tack Hammer performed "Stand By Me" and played guitar, Joseph Moad performed a Jimi Hendrix song on guitar and Brandon Blackwell performed a guitar solo. All the contestants did a great job. The first place winner of $100.00 was Callee Lester. The second place winner of $50.00 was Patsy Wells. The chamber would like to thank our judges Paula Fox and Marci Kitchens. A big thanks to Security State Bank for providing the prize money and sponsoring the KECO radio remote. Thanks to Neva Pyatt for being our emcee. We would also like to thank Jimmy Wilson and Joe Bill Moad for their help. Thanks to Nikki and Jeremy Gourley for the use of their trailer. Thanks to Casey King for the sound equipment. Thanks to chamber members who helped with the talent show Charlene Wilson, Debbie Tweed, Penny Clift, Carrie Lovett, Cindy Clift, Jimmy Beavin, Nikki Gourley and Pat Ver Steeg. Check out our Facebook page for photos and videos of the show. 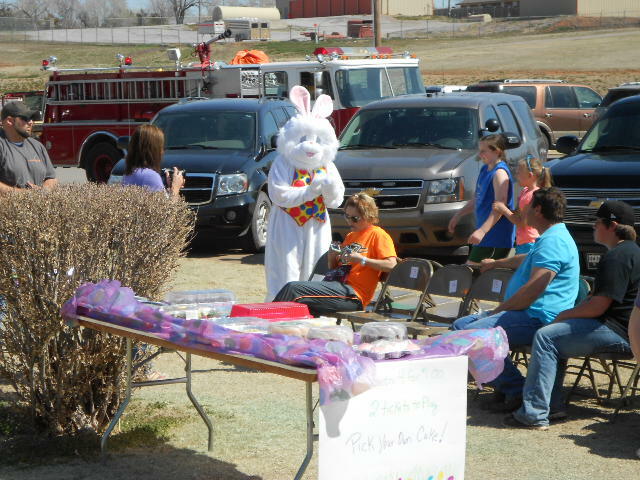 The Cheyenne Roger Mills Chamber of Commerce Annual Easter Egg Hunt was held on Saturday, March 31st. There were lots of excited kids in attendance. 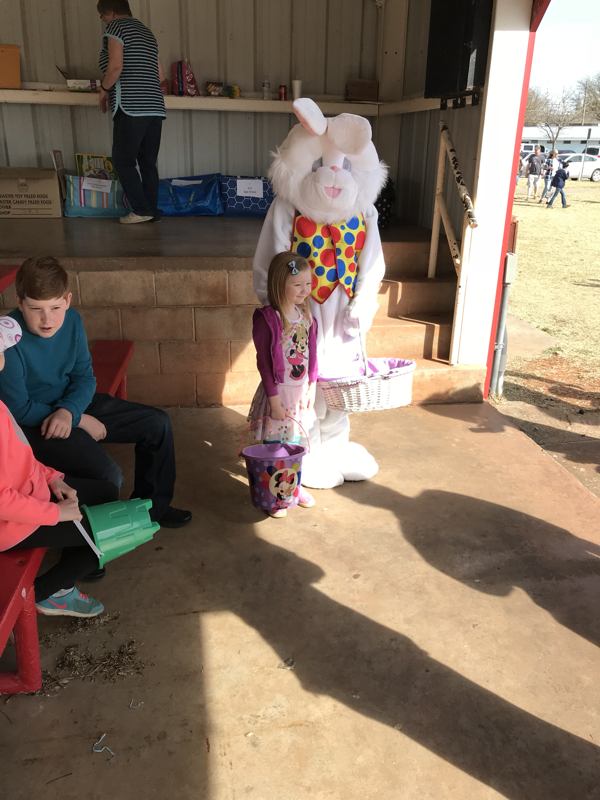 The Easter Bunny paid a visit to the event. The bunny handed out candy and posed for pictures. 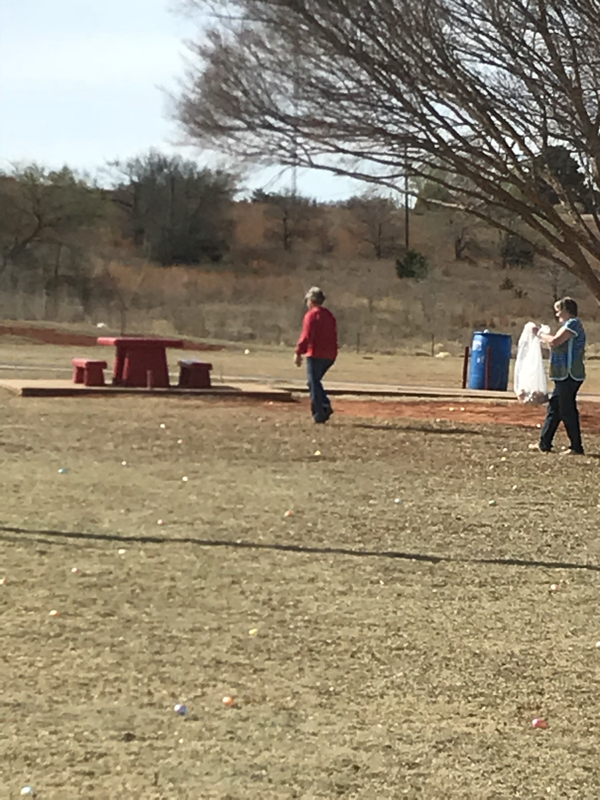 Eggs were hunted. Prizes were handed out. Everyone had a good time. Preston Key, First and Second Grade - Brian Gonzoles, Fourth Grade and Up - Lillie McCaskill. A big thanks to our donors who make this event possible, Security State Bank, Hi-Pro Feeds, Tweed's Hilltop Cafe, Dr. Steven Shrader, Sorosis Club, Barber-Dyson, Northfork Electric, Cheyenne Professional Drug, Metcalfe Museum, Dobson Telephone, Roger Mills Memorial Hospital, York Insurance, Dale and Judy Tracy and Barbara Miller. Thank you to the following businesses who donated prizes - Tweed's Hilltop Cafe, Johnny Mc's Food N Fuel, Jerry's Truck Stop and Market Square. 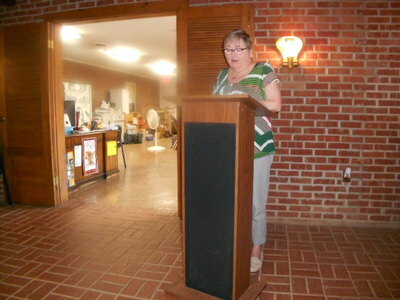 The Chamber would like to thank Cindy Clift for her tireless efforts to make this event happen. 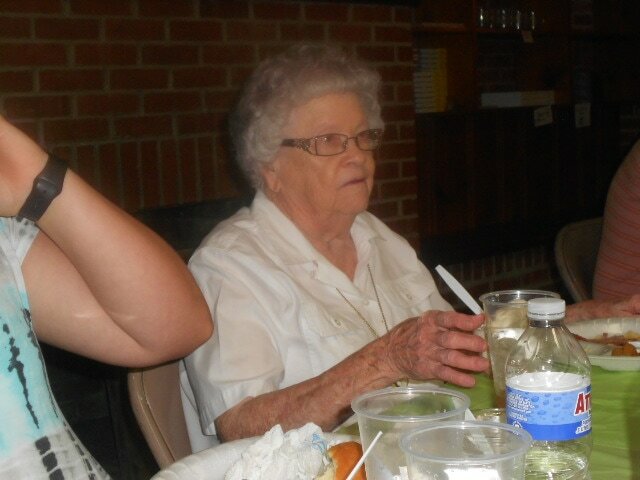 Thanks to Elma Clift for helping stuff some eggs. A big thanks to Kelah Watson and the BPA students for their help. Thank you to everyone who helped the day of the hunt Penny Clift, Cindy Clift, Ashley Durem, Callie Lester, Carrie Lovett, Kelah Watson and Kathryn Harrison. 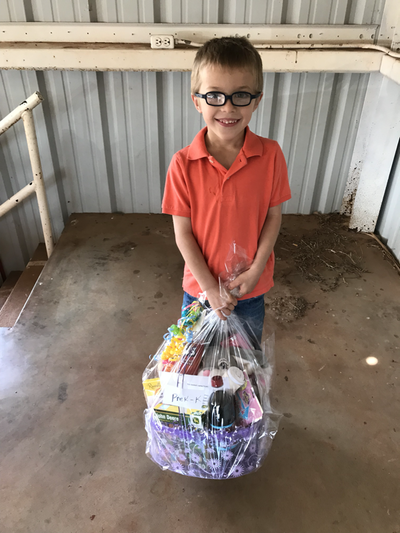 Thanks to Levi Carter for delivering the Easter Bunny right on time. 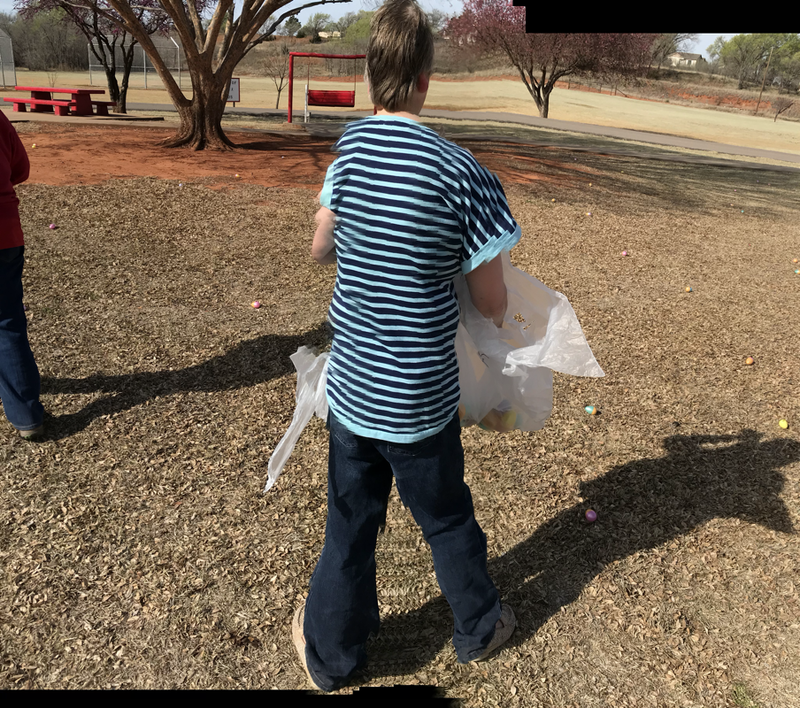 Thank you to Olivia Lucas for her tireless dedication to the Easter Hunt. This is a big event for the Chamber, it takes a lot of money and a lot of time. We appreciate the businesses who support the community by donating. The Chamber would like to thank everyone who turned out and made it a success. Seeing all the children enjoying themselves makes all the work worthwhile! 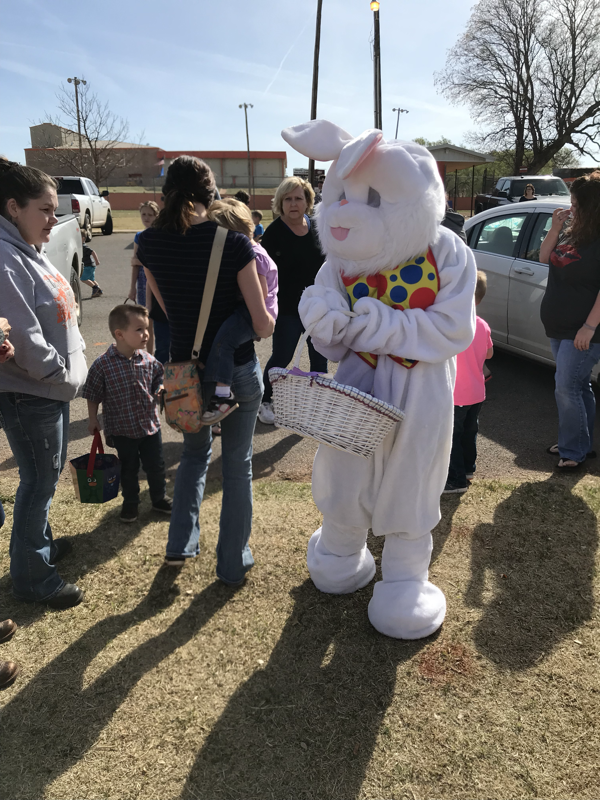 The Cheyenne Roger Mills Chamber of Commerce Annual Easter Egg Hunt will be this Saturday, March 31st. The hunt will be held at the City Park. 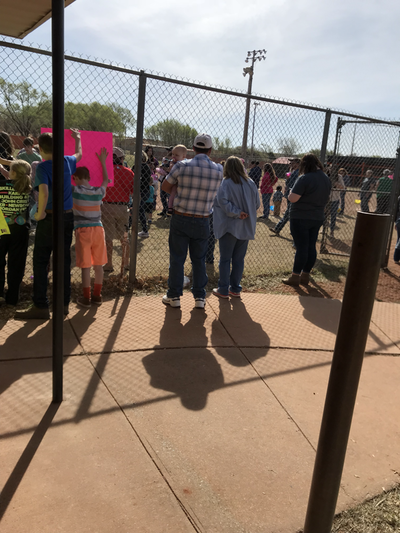 It will begin at 11:00 a.m.
Age groups are 0 to 3 years, Pre-K to Kindergarten, First and Second Grade, Third Grade and Fourth Grade through Sixth Grade. 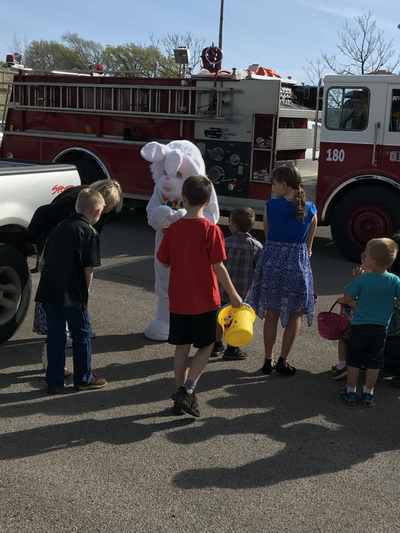 The Easter Bunny will be on hand to hand out candy and pose for pictures. Bring your camera and capture a great memory with the Bunny. Each group will have a prize egg for a grand prize. Every egg will contain a prize or candy. Lots of great prizes! Prize donors are Tweed's Hilltop Cafe, Market Square, Jerry's Truck Stop and Johnny Mc's Food N Fuel. A big thanks to all our donors. Mark the day! We hope to see you there. ARTS & CRAFTS SHOW A SUCCESS! 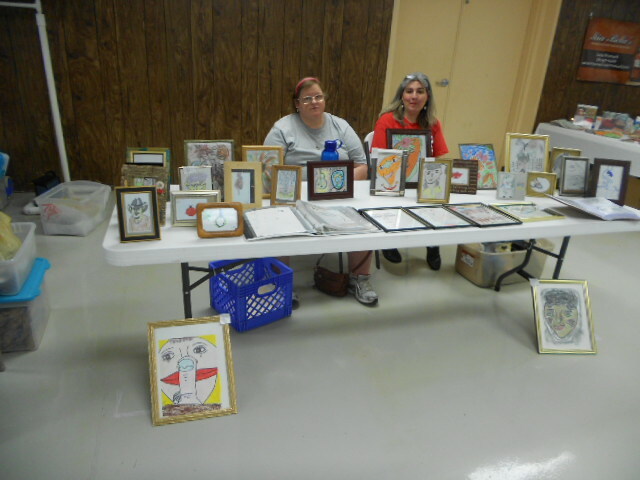 Our Arts & Crafts show was a big success this year! A big thanks to everyone who came and supported the show. We couldn't do it without the community support. The venue was full this year. There were a lot of wonderful booths filled with great things! 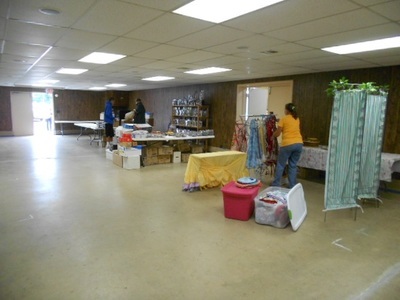 We had jewelry, candles, Christmas items, skin products, hair products, makeup, Crochet items, toys, clothing, handbags, Woodwork, Recycled glass, Pecans, Candy, Essential Oils, Homemade Soap, Art, Casserole Kits, Safety Items, Home Decor, Baby Clothes, Baby Blankets, Tupperware, Stanley and lots more. Door Prizes were given every hour. 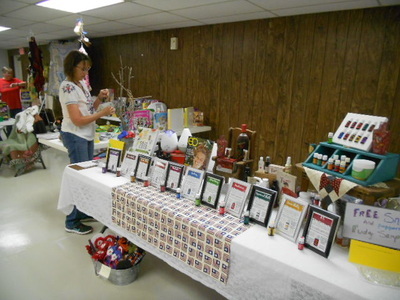 Lucky shoppers won prizes from the vendors as well as craft cash. 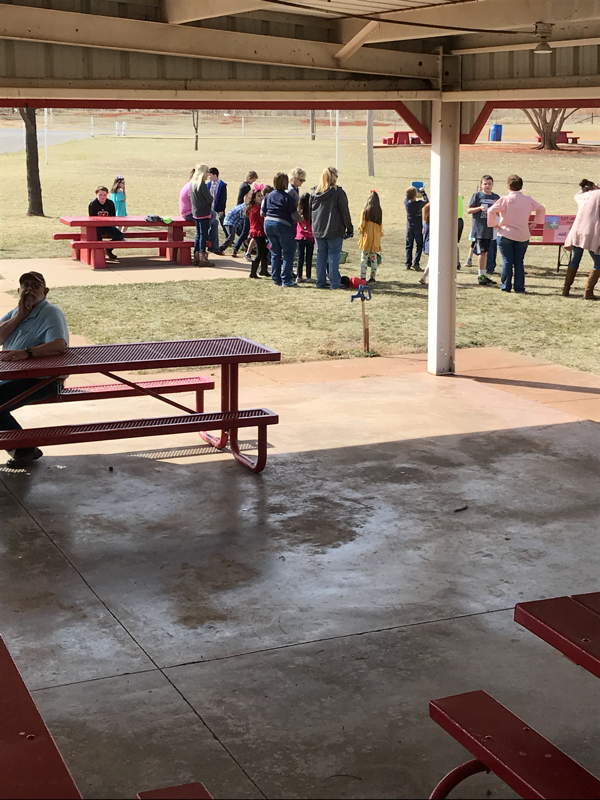 The concession stand was booming with hungry shoppers. 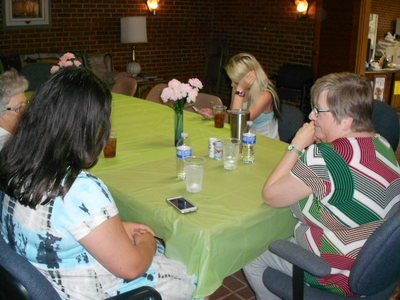 The menu included Mexican Pile On, Hamburgers, Hot Dogs and Homemade Desserts. Santa made his annual appearance at 2:30. 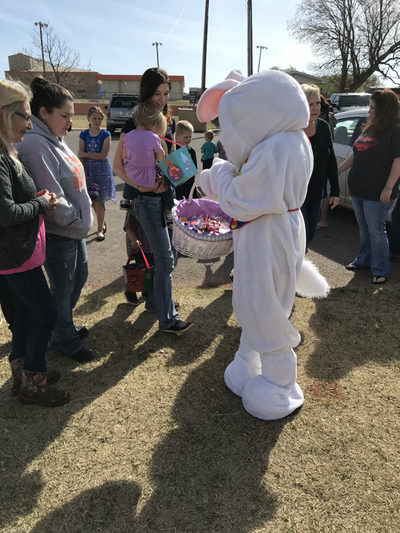 He handed out treats and visited with all the children. 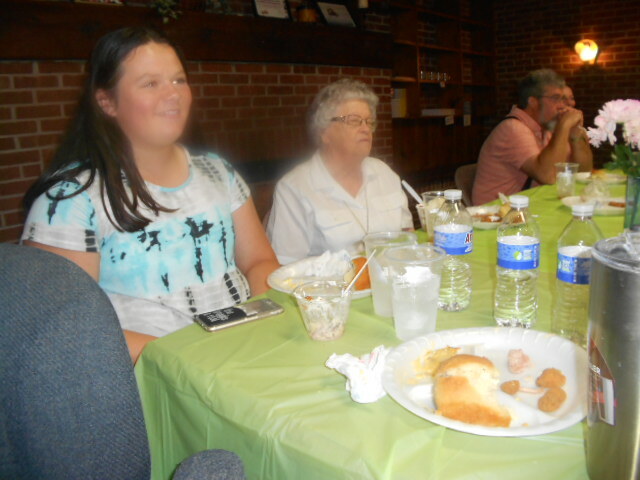 The kids had a great time, young and old alike. 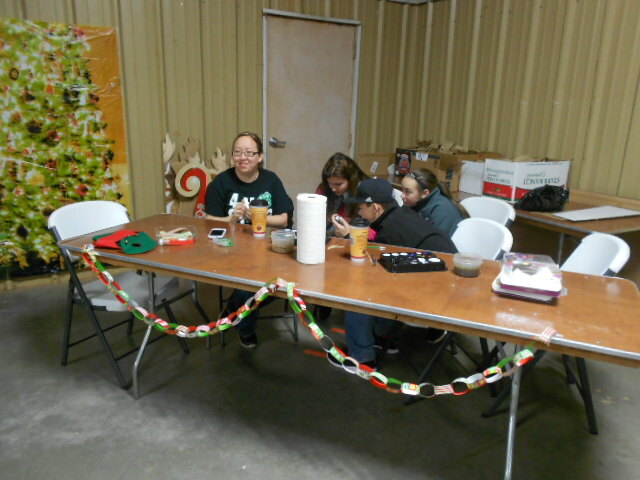 The 4H kids were on hand to do face painting for everyone who wanted to brighten up their appearance! A big thanks to our Christmas donors Four Point Energy, Roger Mills Memorial Hospital, Johnny Mc's, Cheyenne Professional Drug, Northfork Electric, Cheyenne Lumber & Steel, Cynthia Duncan, Security State Bank, Hi-Pro Feeds, Dr. Steven Shrader, Dale & Judy Tracy, Bottom Line Embroidery, Metcalfe Museum and Town of Cheyenne. A big thanks to Gena Bryan and the 4H kids. Thanks to Kelah Watson and the BPA students for their help setting up. 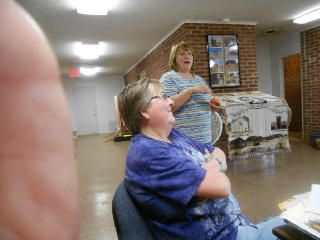 Big thanks to Pat Ver Steeg, Penny Clift, Elma Clift, Carrie Lovett and Cindy Clift for help in set up. Thank you to all our workers, Carrie Lovett, Debbie Tweed, Elma Clift, Nikki Gourley, Judy Tracy, Jimmy Beavin, Debbie Beavin, Jymay McLeod, Penny Clift and Cindy Clift. The Chamber would like to extend a big thanks to Security State Bank for sponsoring our advertising for the show. Thanks to John Smith for making all the children smile. Thanks to Jerry and Charlene Wilson and James and Linda Maddux for donating treats. Thanks to Nikki Gourley and Christina Wright and the Bear Trax crew for sacking the treats. Big thanks to the Roger Mills Fire Department for delivering Santa. 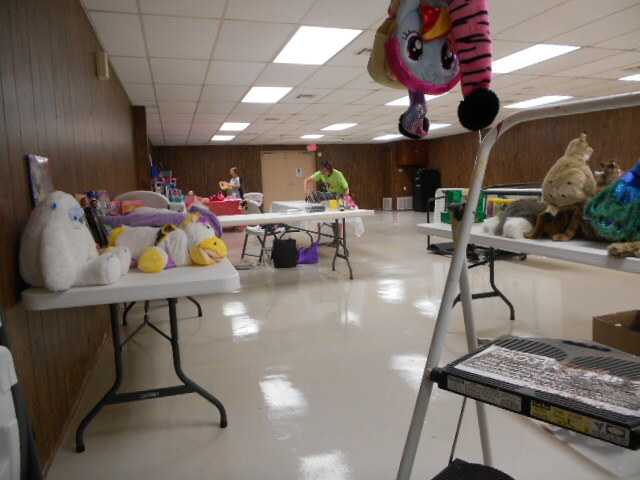 It takes a lot of work and people to make the Craft show happen. We appreciate everyone who helped us in any way. From the crafters to the workers to the donors to the shoppers. THANK YOU! Get ready for some great shopping, delicious food, prizes, fun and even a visit with Santa! 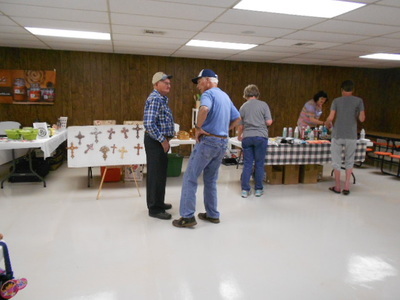 The 8th Annual Cheyenne Roger Mills Chamber of Commerce Arts and Crafts Show will be held on Saturday, November 18th at the Roger Mills Ag Pavilion. This year there will also be a Costume Contest along with the hot dog giveaway. There will be three prizes awarded. Categories will be children 0 to 6 and 7 to 12 as well as a pet costume category. We are reaching out to our members to donate something for the prize baskets. There will be baskets containing several small prizes awarded with a certificate. If you have something you would like to donate please let us know. Contact Cindy at 580-497-3318 or email cheyennecoc@gmail.com. Any small donation will be much appreciated. 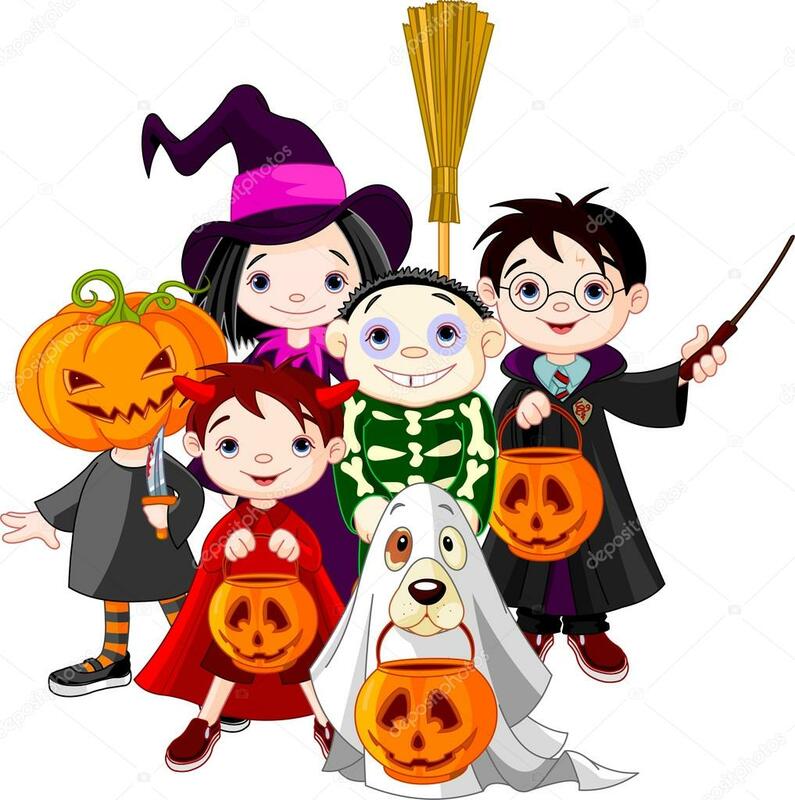 Our goal is to make Halloween a safe and fun event for all our kids. Owa Chita Sundays! A year round extension of our popular Summer Day Camp, Camp Owa Chita. 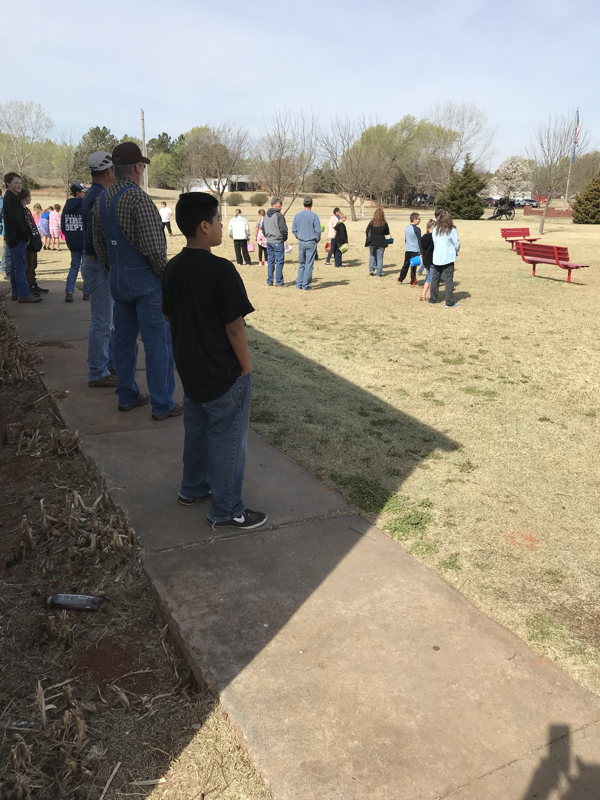 Once a month throughout the year, families and adults are invited to learn about the unique histories and cultures preserved and protected at the Washita Battlefield NHS. You are all welcome to join us in free games, crafts, food, and learning! The last Sunday of the Month, every month at the Washita Battlefield NHS. 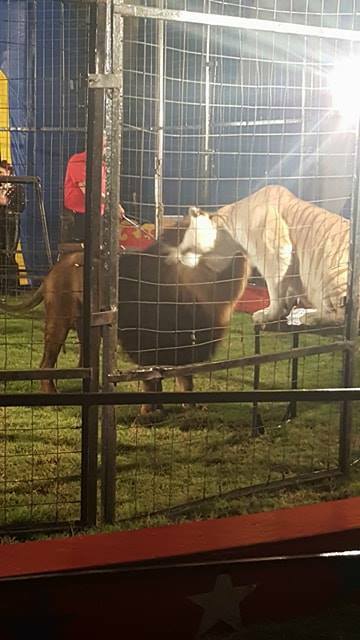 The circus came to town on Friday, September 29th and it was a big success. A sold out crowd at both shows enjoyed all the great entertainment! 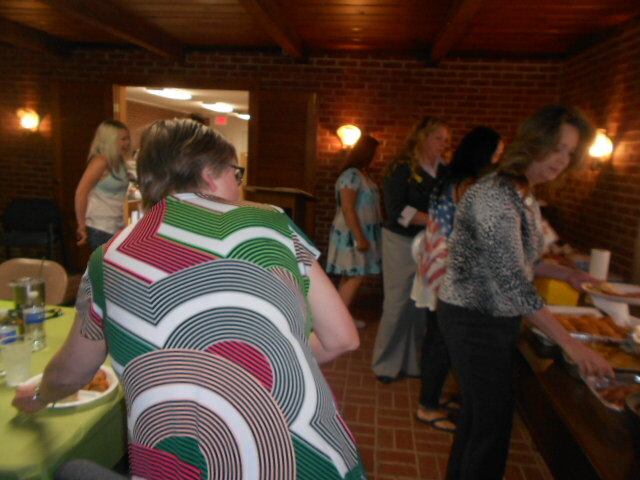 The Cheyenne Roger Mills Chamber of Commerce would like to thank everyone who attended. Your support makes our events a success. We gave away one hundred tickets to Cheyenne School, Reydon School, Hammon School, Cheyenne Senior Citizens, Peanut Guess Winners and winners on KECO. This was made possible by the businesses who purchased tickets. A big thanks to Security State Bank, Roll Grain and Feed, Johnny Mc's, Hi-Pro Feeds, D & G Trash Hauling, Cheyenne Tag Agency, Farm Bureau Insurance, H20 Transport, T-3 String Up, Buster Rural Health Clinic, Farmer's Supply & Transport, Fults Farms, Santa Fe Salon, Kountry Kitchen, Becky's Place, Jerry's Truck Stop, Kenner Farms, Thomas Goodwin Law Firm, Reydon Short Stop, Cheyenne Abstract and Smith Ag. A big thanks to our ticket sellers, Carrie Lovett and Penny Clift at Security State Bank, Cheyenne Professional Drug, Bear Trax, Johnny Mc's, Charolet Lucas at RM Hospital, Jimmy Beavin at RM Courthouse, Jo Nell York and Tweed's Hilltop Cafe in Reydon and Chamber Office. The City of Cheyenne provided a place for the circus to be held as well as providing everything the circus requested. Big thanks to Nehemiah Yager and the city workers for all the help. Neva Pyatt did our radio advertising and ticket giveaway on KECO. Big thanks to her for all her help. Security State Bank was a big supporter. The bank sponsored the radio ads and the clown interview. We appreciate their continued support in all the chamber events. A big thanks to Belinda Chalfant of Cheyenne School and Ryan Baker of Reydon School. They made the clown visit to the schools possible. The winners in the Peanut Guess Contest were Security State Bank winners1st Place Timothy Creel and 2nd Place Pat Ritchie, Bear Trax 1st Place Mai Tran 2nd Place Erasno Duenez, Johnny Mc’s Food N Fuel 1st Place Angel Boyd 2nd Place Jimmie Pruitt, Cheyenne Professional Drug 1st Place Clint Thomas 2nd Place Kathy Thomas, Tweed’s Hilltop Cafe 1st Place Tate Markham 2nd Place Kaden Markham. Thanks to the businesses who ran the Peanuts Game. 1st place winners won a child/senior citizen ticket and the jar of peanuts. 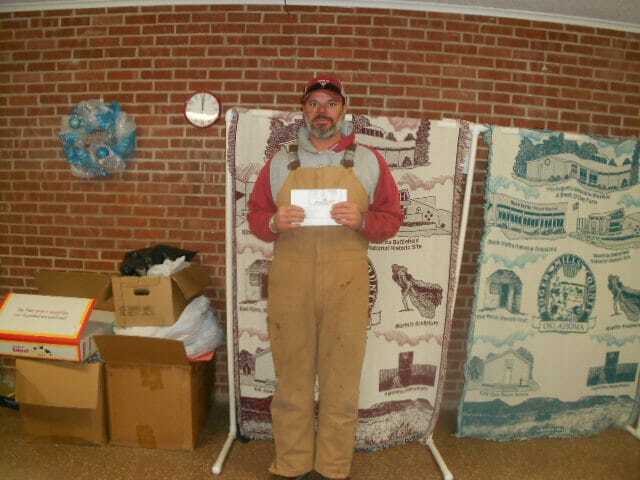 2nd place winners won a child/senior citizen ticket. Congrats to all the winners. We deeply appreciate Cindy Clift and all her efforts in coordinating all Chamber events and making sure they come off smoothly and successfully. It wouldn't happen without her. 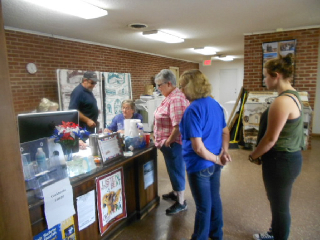 Our circus greeters were Charlene Wilson, Debbie Tweed, Jimmy Beavin and Nikki Gourley. They did a great job! The Chamber is always grateful for all the community support we receive. We look forward to bringing more great events to our community. The Big Top Coming to Cheyenne this Week! 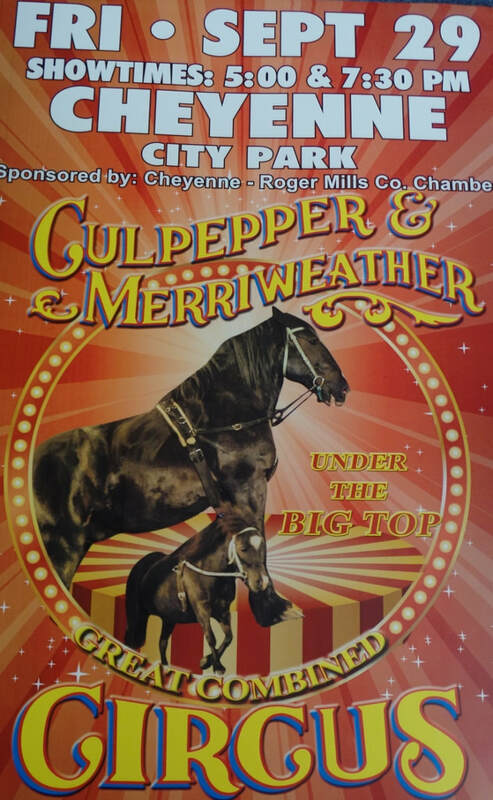 The Culpepper and Merriweather Circus will be in Cheyenne on Friday, September 29th. The big top will go up at 9:30 on Friday morning the Cheyenne City Park. Everyone is invited to come down and watch the park transform into a circus playground! You can take a tour, meet the performers and learn all about the animals. There will be two performances 5:00 p.m. and 7:30 p.m. Advance tickets are $7.00 for children under 13 and senior citizens 65 and older. Adult tickets for 13 and up are $10.00. Tickets at the door will be $10.00 and $13.00. ​Chamber Office,​ Cheyenne Drug, Bear Trax, Roger Mills Memorial Hospital (Charolet Lucas), Johnny Mc's, Roger Mills Courthouse (Jimmy Beavin), Tweed's Hilltop Cafe in Reydon and York Insurance in Durham. Play the Guess the Peanut Game to win a free child ticket plus the jar of peanuts. Second place will win a free child ticket. Guess how many peanuts in the jar in the following Chamber businesses: Security State Bank, Cheyenne Drug, Bear Trax, Johnny Mc's and Tweed's Hilltop Cafe. Winners announced Wednesday September 27th. Listen to KECO Radio for a chance to win free tickets. Tickets given away every day this week. Sponsored by Security State Bank. She gave two lucky students a chance to perform with Macaroni. Brandon and Bailey each took turns balancing Macaroni on their finger. They were great performers! They went for a total count of 26 each winning a free circus ticket. Skeeter also visited Reydon School to entertain more boys and girls! 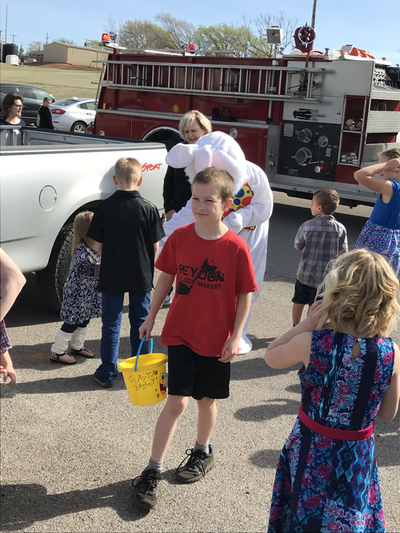 The Chamber would like to say a big thanks to Belinda Chalfant and Ryan Baker for allowing Skeeter to visit each school. America’s Favorite Old-Fashioned Big Top Circus is Coming to Town! Thanks to the sponsorship of the Cheyenne-Roger Mills Co. Chamber of Commerce, Culpepper & Merriweather Circus, America’s Favorite Big Top Circus is coming to Cheyenne, OK on Friday, September 29th, 2017 to the City Park located on Pioneer Parkway with scheduled performances at 5:00 & 7:30 p.m. Now in its 32nd edition, C&M Circus has become internationally known for quality family entertainment. This authentic One-Ring, Big Top Circus has been featured on National Geographic’s Explorer TV series, Entertainment Tonight, The Los Angeles Times, The Chicago Tribune, Arizona Highways Magazine. It has also been featured on the A&E Special: Under the Big Top and most recently, On the Road with Circus Kids, a Nickelodeon special featured on the Nick News Program. ​Bring your friends and family out circus morning to watch as a familiar place in your town is transformed into a bustling Circus City. Activity swirls around the grounds as animals are unloaded, the Big Top is erected, and rigging is prepared for performances later in the day. Enjoy the magic and tradition of the American Circus with your family and create memories that will last a lifetime. Between 9:30 and 10:00 a.m. come watch the raising of the Big Top, then stay for the FREE Tour. 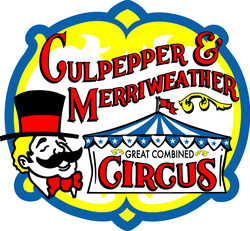 This presentation offers a unique face-toface opportunity for families, schools, and interested community members to meet and learn all about the Culpepper & Merriweather Circus family and includes a walking tour of the circus grounds. Learn interesting facts about our performers, the history of our show and the different species of animals in our Circus Family. In this presentation we will also address topics such as hygiene, grooming and the veterinary care all of our animals receive. In recent years the Tent Raising and Morning Tour has become a popular program for families and interested community members. It is presented in a way everyone, young and old can learn many interesting facts about the Culpepper & Merriweather Circus Family. This is a special part of Circus Day that should not be missed! On circus day, our performers bring the magic of the circus to life in each 90-minute performance. This year’s lineup includes an All-Star group of performers and entertainers that include: Miss Simone and her breath taking single trapeze, Miss Paulina’s proud “ Big & Little” prancing ponies, The Arlise Troupe on their wild and crazy unicycles, Natalie’s American Eskimo Escapades, Miss Georgia displaying flexability to the extreme and for the first time, the Wheel of Destiny & Tight Rope by The Perez Family. But, lets not forget our favorite performing Jungle Cats, Soloman, Delilah & Francis, presented by Mr. Trey Key, that will certainly have you on the edge of your seats! All accompanied by original music composed by the talented, Matt Margucci from Los Angeles, California. Our performers are sure to amaze, delight and entertain the audience members of all ages beyond your wildest imagination. The costumes alone are certainly of Las Vegas quality. For more information visit our FaceBook page with videos, photos and comments from past sponsors and patrons. 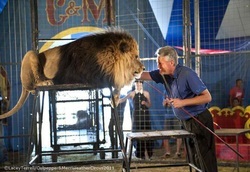 For a direct link you can go to www.cmcircus.com and click on the FaceBook link. SAVE MONEY by purchasing your tickets in advance at the following locations: Bear Trax, Chamber of Commerce Office, Cheyenne Professional Drug, Jimmy Beavin-Courthouse, Johnny Mc’s Food N Fuel, Jo Nell York, Roger Mills Memorial Hospital-Charolet Lucas, Security State Bank, and Tweed’s Hilltop Cafe. Prices for advance tickets are $10.00 for adults and $7.00 for seniors (65 and over) and children ages 2 to 12, children under 2 are always free. On show day tickets will be $13.00 for adults and $8.00 for seniors and children. Reserve your tickets early and save. For more information or to reserve discount tickets call 866 BIG TOP 6. Reservations will be available even on show day but, only at this number till 4:00 p.m. Monday – Friday, Central Time. The Cheyenne Roger Mills Chamber of Commerce held their annual Volunteer of the Year lunch on Thursday, June 8th. 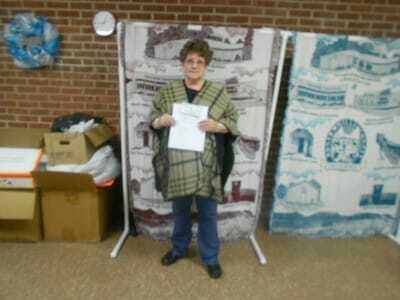 This year's winner is Elma Clift. 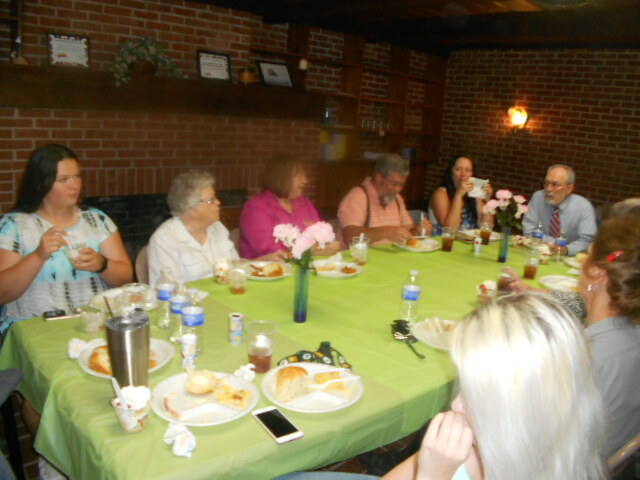 The luncheon was attended by Elma's granddaughters, Brittany and Allie Clift as well as chamber members. . 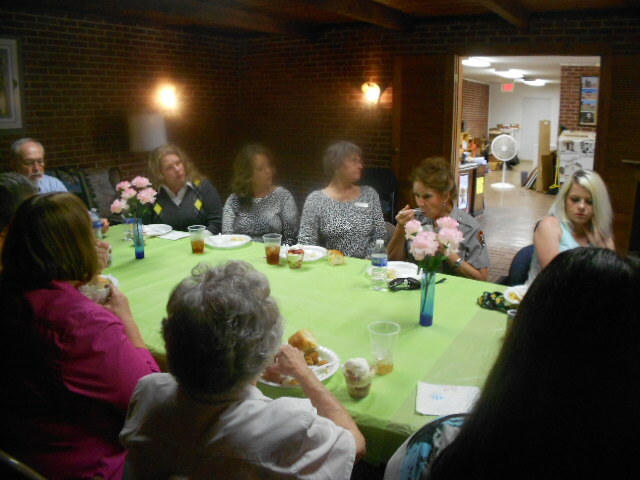 Guests enjoyed a delicious lunch catered by Christy Batchelor. 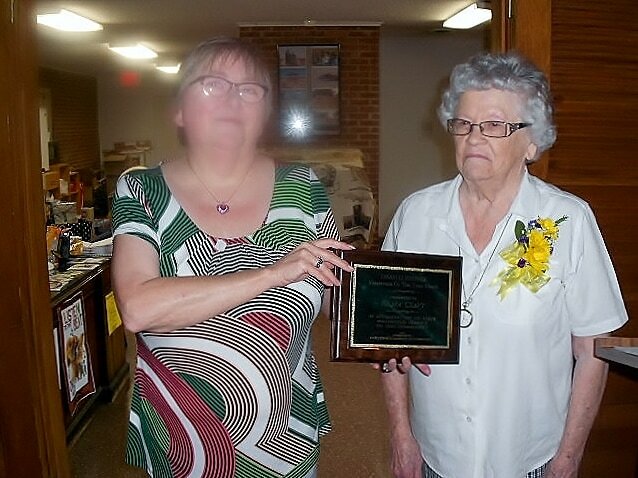 The chamber salutes Elma for her dedicated volunteer service over the years. ​Elma is 81 years young and still going strong. Every spring finds her at the Chamber office stuffing Easter Eggs for the Annual Chamber Easter Egg Hunt. She often walks the 5 blocks from her house to the Chamber office. 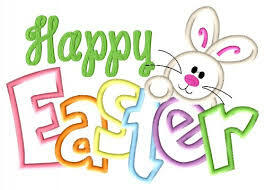 Stuffing Easter eggs might not sound like a hard job but believe me it is a big task. The event has hundreds of prizes which have to be stuffed inside the eggs. Cindy makes the coupons and Elma stuffs them inside the eggs. The whole process takes several days and involves thousands of eggs. 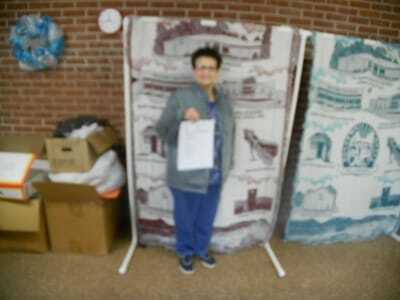 Elma also volunteers her time every year at the Chamber Craft Show. She helps clean the kitchen during the set up. She comes at 8:00 a.m. on the day of the show and gets things ready in the concession stand. 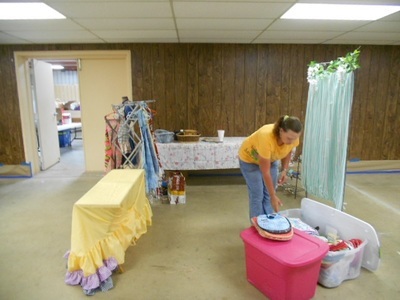 She works in the concession stand all day and then helps clean up afterward. This is amazing at her age. There have been times when the concession serves Sloppy Joes. Elma made the sloppy joes. This is a big order! Twenty pounds of hamburger turned into a delicious sloppy joe mixture. Elma has also helped at the Flea Market in the summer. She has volunteered her time at the library and the Senior Citizens Center. Elma has given selflessly of her time for years with no recognition. I think she has waited long enough! Please consider her for Volunteer of the Year. Security State Bank, Johnny Mc’s Food N Fuel, York Insurance, Northfork Electric, Cheyenne Lumber & Steel, Dr Shrader, Roger Mills Memorial Hospital, Smith Ag Center, Santa Fe Salon, Dale & Judy Tracy and Cheyenne Professional Drug. Looking for a great Christmas gift? You can find unique and wonderful items at this weekend's Arts and Crafts Show! 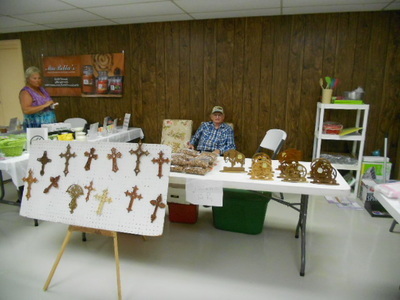 The Annual Arts and Crafts Show sponsored by the Cheyenne Roger Mills Chamber of Commerce is this Saturday, November 19th at the Roger MiIlls Ag Pavilion. Doors open at 9:00 a.m and close at 4:00 p.m. This year's show has lots of new vendors as well as some of your favorites. You will find Jewelry, Younique makeup, Norwex, Stanley, Fuller Brush, Scentsy, Toys, Throws, Tshirts, Scarves, Ready Made Casseroles, Christmas Items, Salsa, Jams and Jellies, Folkmanis Puppets, Homemade Peanut Brittle, Perfectly Posh, Towels, Oven Dresses, Clothes, Baby Items, Hats, Crochet Fleece, Wooden Boxes, Wreaths, Celebrating Home, Christmas Ornaments, Metal Cut Out Art, Kitchen Items, Table Runners, Party Company Purses, Totes, Mum Company skincare & vitamin supplements, Premier Jewelry, Lipsense , Essential Oils, Mia Bella Candles, Leather Items, Baked Goods by Christy Batchelor, Houseplants, Kids Clothes and much more. The Trendy Trailer will be back again. You can find it on the South Side of the Ag Pavilion. Something for everyone! There will be a concession serving hamburgers, hot dogs, nachos, baked potatoes, soup and desserts. Takeout is available upon request. Come have a great lunch after shopping. Door prizes will be given. Come and play Christmas Trivia to win a gift certificate from one of our businesses. There will also be a Kid's Trivia Game for prizes! Come and test your Christmas knowledge and win a prize! Santa will also be making a trip from the North Pole. He will arrive at 2:30 and stay until every child has given him their wish list. Santa will be handing out treats to good boys and girls. Mark your calendar for all the fun, food and great shopping! Don't miss it. For more information contact Cindy at 580-497-3318. 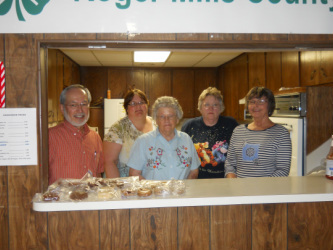 The Cheyenne Roger Mills Chamber of Commerce would like to thank everyone who supported us by buying peaches or pears. Delivery day went very smoothly! A big thanks to Principal's Leadership Council students Callee Hammer, Jake Hammer, Tack Hammer, Garyn Batchelor, Hadley Smith, Aaron Broadwater, Nathan Jackson and Leah Sander for loading the peaches. We would also like to thank Chamber workers Jimmy Beavin, Nikki Gourley, Carrie Lovett, Charlene Wilson, Penny Clift and Cindy Clift. We will be selling peaches again next summer so don't miss out! Cunningham Peaches are coming to the Cheyenne Roger Mills area! All orders must be placed by August 5th. Call 580-497-3318 or 580-497-3354 to place your order or for more information. 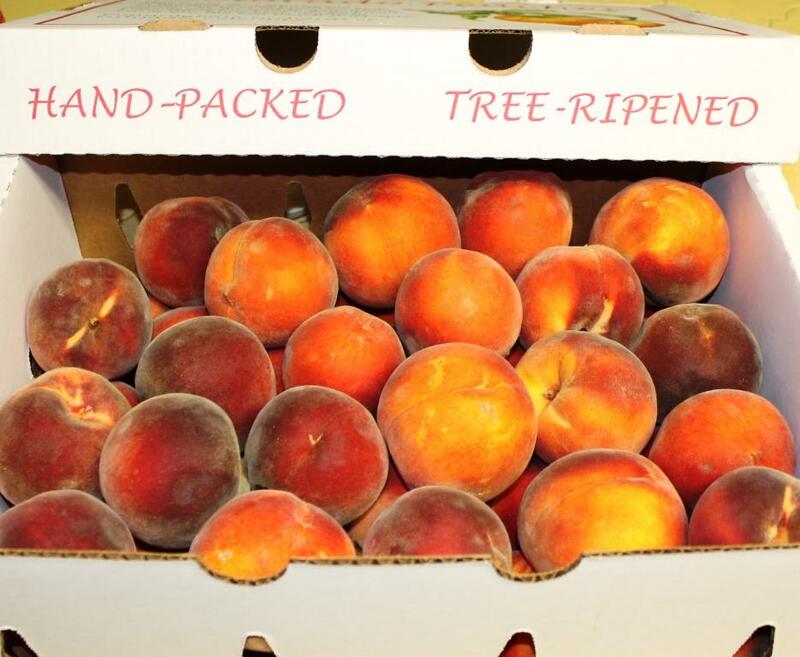 Grown in Palisade, CO, these juicy peaches are Tree Ripened and Hand-picked from the Cunningham family to yours! If this is your first time to eat a Cunningham peach, you are in for a treat! Come experience what everyone’s been talking about since 1972. 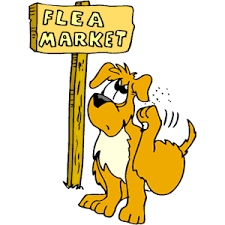 ​The Cheyenne Roger Mills Chamber of Commerce Annual Flea Market and Citywide Garage Sales will be held on Saturday, June 11th. 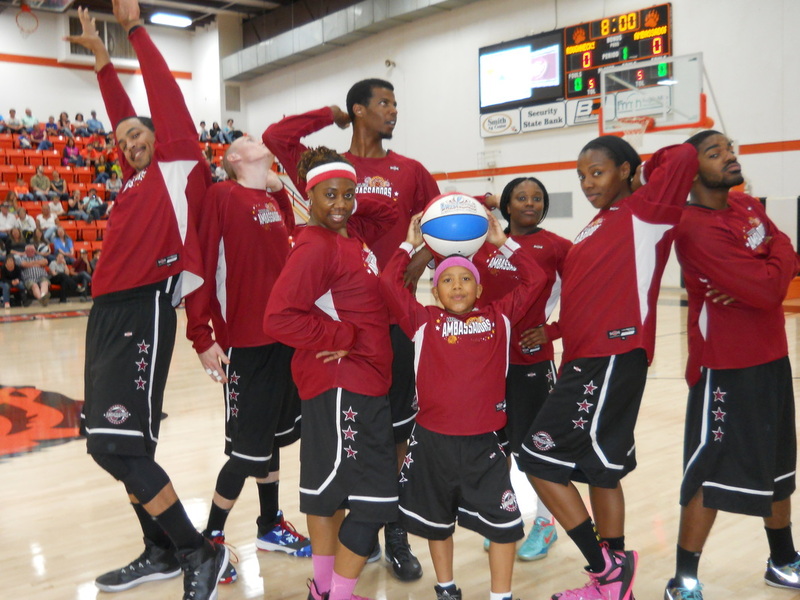 The Harlem Ambassadors will take on the Roger Mills Roughnecks once again. This year's Roughneck team includes Jennifer Whitson, Hannah Holloway, Whitney Moore, Ryan Baker, Terry Steinbeck, Lindsay Bogges, Shadd Bogges, Nikki Gourley, Abbey Hartley, L.D. Powers, Phillip Stark, Leisha Carlson, Belinda Chalfant, Taylor Swisher and Kevin Bowles Mohr. Sponsors for this year's game include Security State Bank, Johnny Mc's Food N Fuel, Roger Mills Memorial Hospital, Cheyenne Tow, Northfork Electric Cooperative Inc, Steven Shrader DDS, First National Bank and Trust of Elk City, New York LIfe Insurance - Jim and Frances Dearing, Western Oklahoma Wellness Initiative, Hi Pro Feeds Inc., Cheyenne Drug, State Representative Todd Russ, Smith Ag Center, Tweed's Hilltop Cafe, Dobson Telephone, Creative Tees, Clarion Inn Elk City, Markham Angus, KECO Radio, KADS, KOOL 94, THE ROCK CHRISTIAN MUSIC, The Penny News, Town of Cheyenne, Cheyenne Star, Turley Ranch, T-3 String Up LLC and Dale and Judy Tracy. Tickets may be purchased at Security State Bank, Martin's Trading Post, Johnny Mc's, Cheyenne Drug, Bear Trax, Charolet Lucas at Roger Mills Hospital, Jimmy Beavin at the Roger Mills County Courthouse, York Insurance Jo Nell York, Tweed's Hilltop Cafe in Reydon, Northfork Electric in Sayre, Elk City Youth Programs (next to fire station) and the Chamber Office. What a SUCCESS last year was!!! 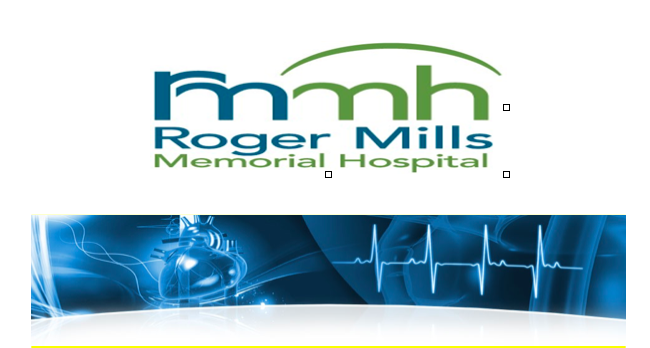 Roger Mills Memorial would like to thank our community for supporting our calcium score heart special last year!! We had over 200 participants!! RMMH will continue the tradition of offering another special in recognition of February being heart month. The special will run the entire month of February for a fee of $29 per exam. 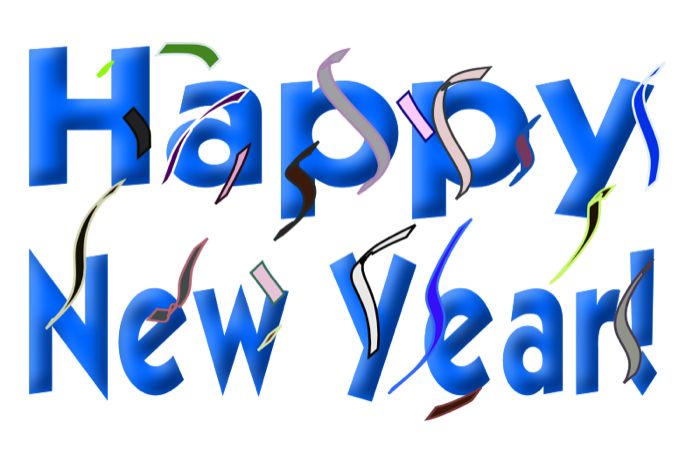 We hope your experience this year will be as positive as it was last year. Our goal is to positively touch lives and bring heart health to the attention of our patients. RMMH has made arrangements with our Radiology group and you will ONLY pay the $29 fee at time of service. Am I a GOOD candidate for a calcium score test? If you have a stent or pacemaker we are unable to perform the CT calcium score. The material in your chest produces artifacts, and the final result is compromised. If you are already under the care of a cardiologist you should visit with your provider to see if this exam is beneficial. The Cheyenne Roger Mills Chamber of Commerce is proud to welcome Tumbleweeds as a new member. Tumbleweeds is the new restaurant in Cheyenne. Tumbleweeds is owned by Christy and Jeffrey Eis. They feature home style cooking. Each night of the week Tumbleweeds offers a special. There is something for everyone from meatloaf to tacos to fried chicken. Tumbleweeds is open every day of the week. Their hours are Monday, Tuesday, Thursday, Friday and Saturday 6 a.m. to 9 p.m. Wednesday 6 a.m. to 2 p.m. and Sunday 8 a.m. to 8 p.m. Tumbleweeds is located on Main Street. Come by and check them out. From breakfast to dinner, you can get a delicious meal. If you are in a hurry you can call for takeout. Tumbleweeds number is 580-497-2227. If you haven't tried Tumbleweeds please come check them out. PLAY THE SECRET ELF GAME AND WIN A PRIZE! We have one winner so far in the Secret Elf Game! Congratulations to Colby Perez! The participating chamber businesses are Security State Bank, Cheyenne Professional Drug, Cheyenne Star, Reydon Hilltop Cafe, Washita Battlefield Gift Store, Cheyenne Floral, Tumbleweeds Family Dining, Market Square, Bear Trax, Johnny Mc's Food n Fuel and Martin's Trading Post. READY TO HAVE SOME FUN AND WIN A PRIZE? PLAY THE SECRET ELF GAME! 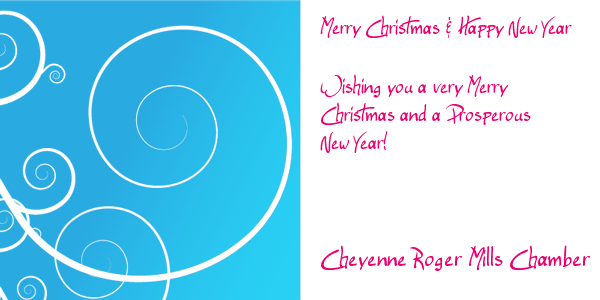 The Cheyenne Roger Mills Chamber of Commerce is issuing a Christmas Alert. One of Santa's elves was left behind during his recent visit to Cheyenne. This absent minded elf is now hiding out in Roger Mills County waiting for Santa to swing by on Christmas Eve. If you can find the elf he will be forced to reward you with a prize to keep you from revealing his whereabouts! The elf is being useful by helping out a different chamber business every day. If you want to win a great prize, here is your chance! Play the Secret Elf Game. There can be 11 winners. Simply visit the 11 businesses the elf is helping out and guess the secret elf from the business employees. Players get one guess per business per day. The elf will be in a different business every day. One win per person. If you guess correctly you win $5.00 in Santa bucks. 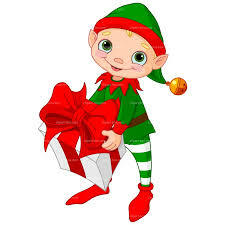 The elf will then give the winner a Christmas task to perform. The elf will make a video or photo of the winner performing their task. 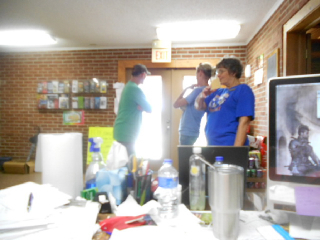 Videos and pictures will be posted on the Chamber Facebook Page and website. Once the winner performs the task, the business presents them with a special prize. So get ready to find the Secret Elf! Win a great prize and have some fun. The game starts on Thursday, December 10th and ends on Saturday, December 19th. The participating chamber businesses are Security State Bank, Cheyenne Professional Drug, Cheyenne Star, Reydon Hilltop Cafe, Washita Battlefield Gift Store, Cheyenne Floral, Tumbleweeds Family Dining, Market Square, Bear Trax, Johnny Mc's Food n Fuel and Martin's Trading Post. Winners will be announced at the end of the game. What are you waiting for? Get out there and find that elf! BUY CHANCES ON A $500 VISA GIFT CARD!!! The Cheyenne Roger Mills Chamber of Commerce is selling chances on a $500.00 Visa gift card. Chances are 1 for $5.00, 3 for $10.00 and 7 for $20.00. Chances may be purchased at Cheyenne Drug, Security State Bank,Charolet Lucas Roger Mills Hospital, Bear Trax, Tweed's Hilltop , RM Courthouse from Jimmy Beavin and the Chamber office. The drawing will be held December 18th. 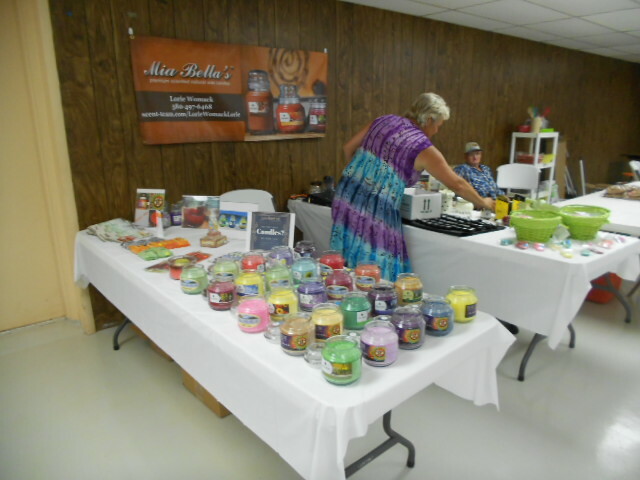 The Chamber of Commerce Annual Arts and Crafts Show is this Saturday! Come and join us for great food, great shopping and lots of fun. The show is on Saturday, November 21st at the Roger Mills Ag Pavilion. Doors open at 9:00 a.m. and close at 4:00 p.m. This year's show will feature lots of new vendors as well as returning favorites. 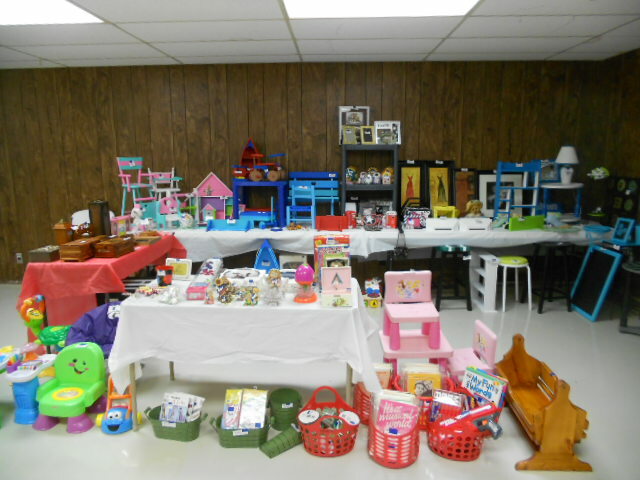 Some of the things you can find include Christmas items, wooden furniture such as rocking chairs, children's handmade tables and chairs, jewelry, Scentsy candles, toys, Folkmanis puppets, Norwex, Tupperware, Stanley, baby blankets, handsewn items, candy, baked goods, Younique makeup, Lipsense, Essential Oils and so much more. The concession stand will open at 9:00 a.m. There will be sausage and biscuits for breakfast. We will be serving hamburgers, hot dogs, nachos, baked potatoes and homemade desserts. Takeout is available upon request. Santa will be visiting at 2:30. He will visit with all the children and hand out treats. The kids can also have their face painted. Face painting will be from 10:00 a.m. to 3:30 p.m. There will be hourly door prizes. We have some great prizes to give away! Saturday will be your last chance to buy a chance on the Christmas Basket. The drawing will be held at the end of the show. Don't miss your chance to win this Ultimate Christmas Basket. 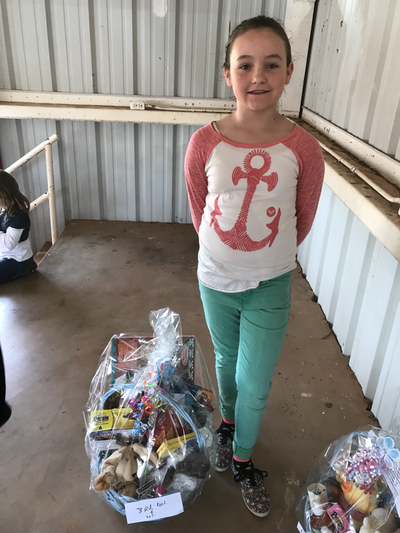 The basket contains items totaling over $900.00. It holds gift certificates, Velocity Cruz android tablet, toys, perfume set, men's cologne set, Woodwick candle, Scentsy warmer, family photo frame, bluetooth headset and much more. Get your chance before the drawing on Saturday! See you there! For more information contact Cindy at 580-497-3318. Santa Claus will be flying into Cheyenne on Saturday, November 21st. It is his first visit of the Christmas season. All good boys and girls get your lists ready! 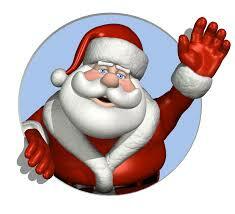 Santa is visiting the Cheyenne Roger Mills Chamber Arts and Crafts Show at 2:30 pm. in the the Roger Mills Ag Pavilion. I hear he is loaded down with bags of treats! Parents are invited to bring their cameras to capture the moment. Mom can also shop the Arts and Crafts Show for some unique and beautiful items. 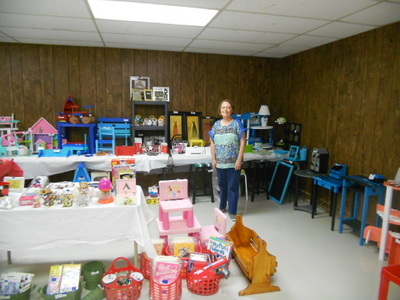 She can find things such as toys, makeup, jewelry, skin care products, hair products, candles, Christmas items, furniture, baked goods, plants and much more! 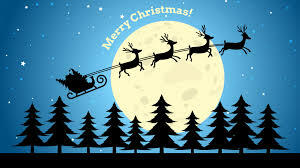 Come and visit Santa! Get a bag of treats as you give Santa your wish list. 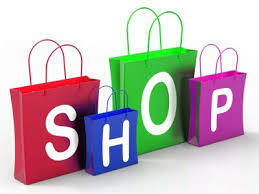 Enjoy shopping and visit the concession stand for a treat. Just three weeks until the Chamber of Commerce Annual Arts and Crafts Show! This year's show is on Saturday, November 21st at the Roger Mills Ag Pavilion. 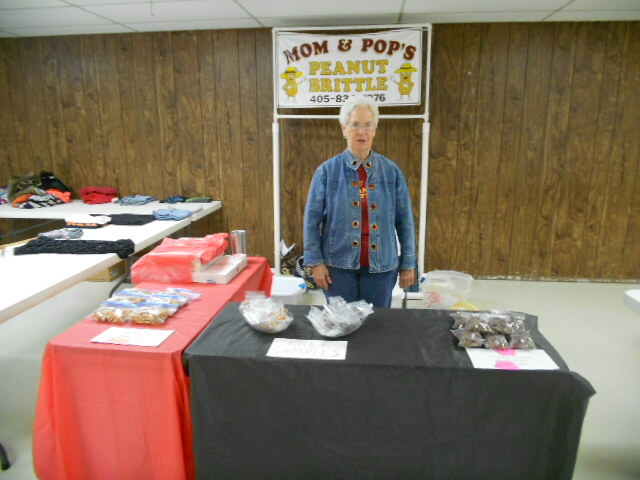 Doors open at 9:00 a.m. and close at 4:00 p.m.
Cindy Malson is a new vendor. Cindy is from Cheyenne. Her booth will feature delicious candies. The Cheyenne Roger Mills Chamber of Commerce would like to invite all downtown trick or treaters to stop by the Chamber office for a free hot dog. 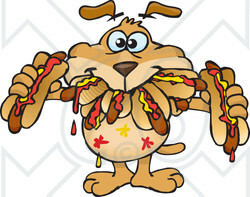 We will be handing out hot dogs and drinks on Friday, October 30th from 3:00 to 5:00 p.m. until all hot dogs are gone. 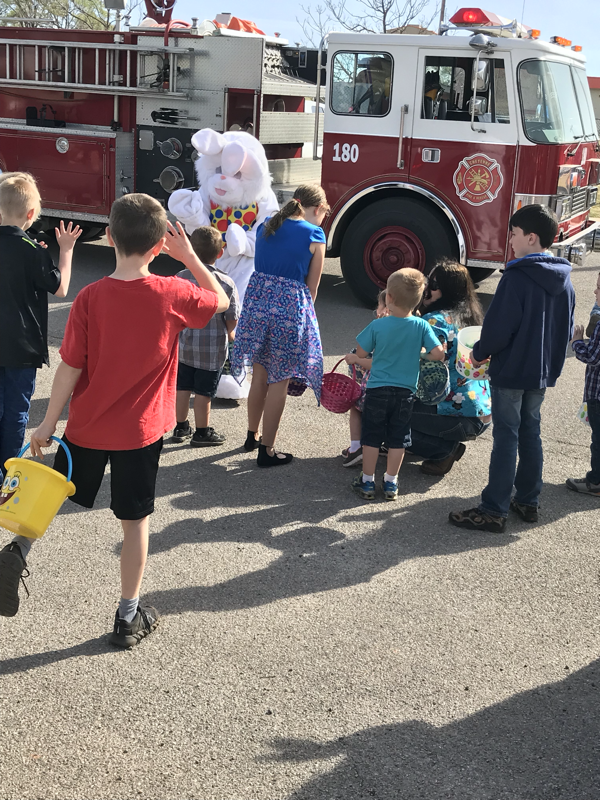 Businesses will be handing out treats downtown from 3:00 to 5:00 p.m. 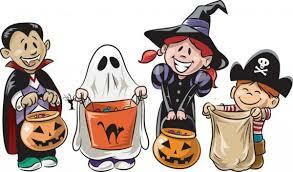 Regular trick or treating will be on Saturday, October 31st. So stop by the Chamber office and get a free hot dog as you trick or treat the downtown businesses. The Chamber office is located in the old Museum building, across the street from Bear Trax. See you there! Happy Halloween! Chamber of Commerce Fall Decorating Contest. Get your decorating hat on and get busy. There will be a first and second place prize awarded for best decorated residence. There will also be a first place Certificate awarded for best decorated business. The theme can be Fall or Halloween. 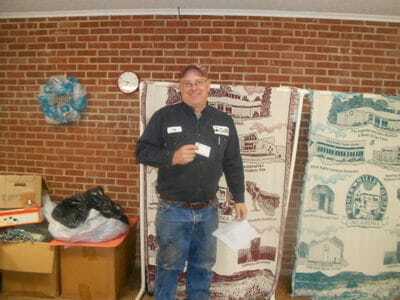 The first place residential winner will receive $30.00 and second place will receive $20.00 in Craft Cash, which can be spent at the Annual Chamber Christmas Arts and Crafts Show on Saturday, November 21st. The first place business will receive an Award Certificate they can display in their business. 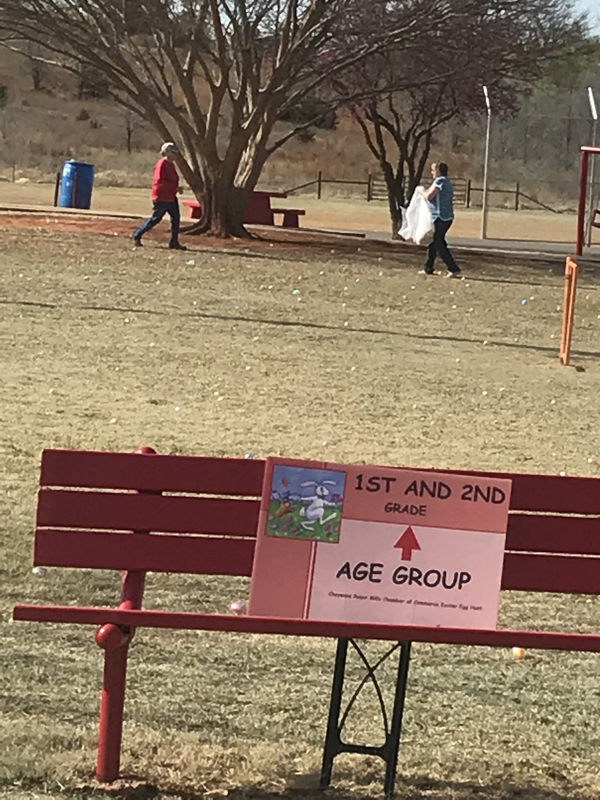 get a number to be displayed along with their decorations. Numbers are available at the Chamber Office or Security State Bank during business hours. 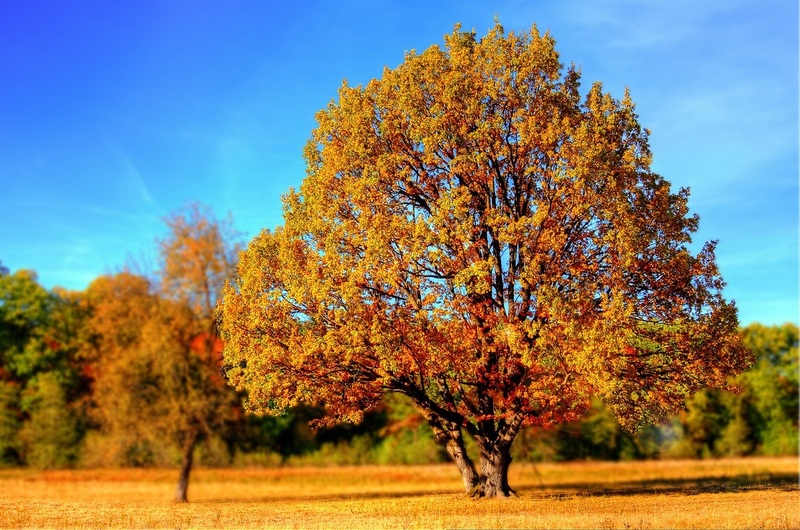 Fall will be here soon! Our upcoming events are the Fall Decorating Contest in October. The Downtown Trick or Treating will be on Friday Oct 30th from 3PM-5PM. 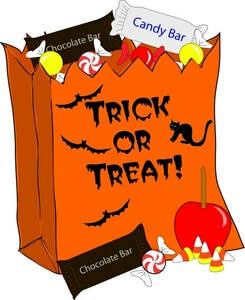 Resident Trick or Treating will be on Saturday October 31st. The Christmas Arts & Crafts Show will be on November 21st. Reserve your booth now for the Craft Show. Booth space is 8x10 $35 a space. Contact the Chamber Office at 580-497-3318 or email us at cheyennecoc@gmail.com for more information. Spring is here and that means spring cleaning! The perfect time to get things together for the Chamber of Commerce Annual Citywide Garage Sale/FleaMarket event. The Flea Market and Garage Sales will be held in the Roger Mills Ag Pavilion on Saturday, June 13th. Rent a booth and join us. Garage Sale booths are $20.00 and Vendor Booths are 25.00. There will be a concession stand serving delicious food. 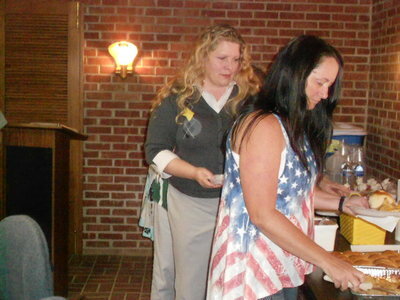 Enjoy BBQ, hot dogs, chili, nachos, frito chili pie, baked potatos and more.This was a great event last year. 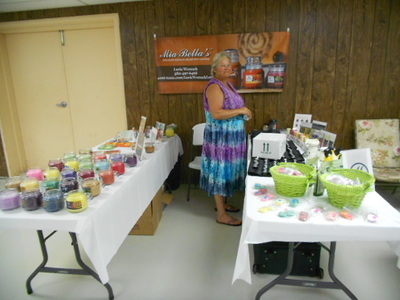 The attendance was high and everyone enjoyed good sales. Citywide Garage Sales will be going on all day, so there will be lots of great browsing. 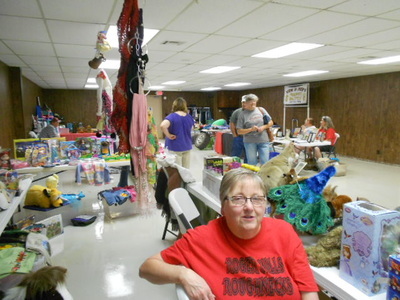 Garage Sale Booths feature used items and Vendor Booths feature handcrafted and new items. Reserve your space today. Enjoy selling in an air conditioned environment. Get your garage sale listed on the map for $5. For more information contact Cindy at 580-497-3318 or Penny at 580-497-3354. THANK YOU TO ALL OUR HARLEM AMBASSADORS VOLUNTEERS AND SPONSORS! 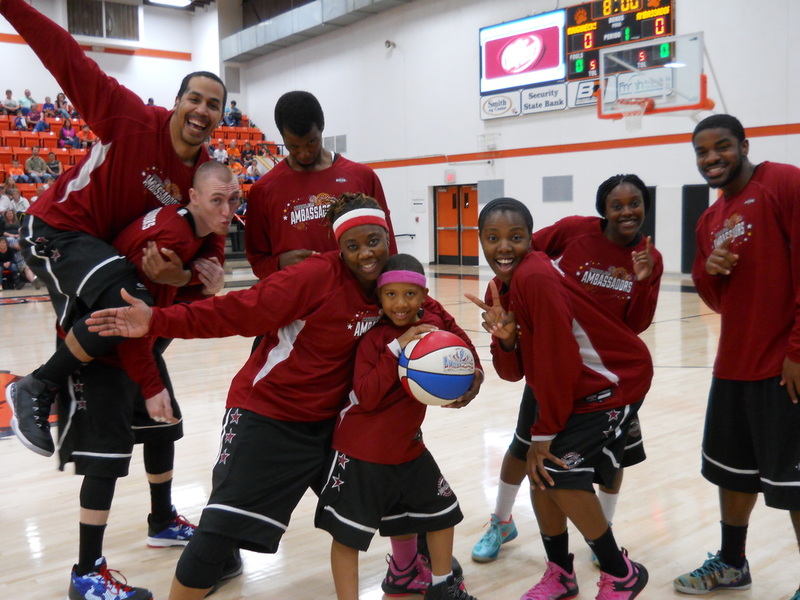 The Cheyenne Chamber of Commerce would like to thank everyone who attended the Harlem Ambassadors basketball game on April 10th. The game was a big success. 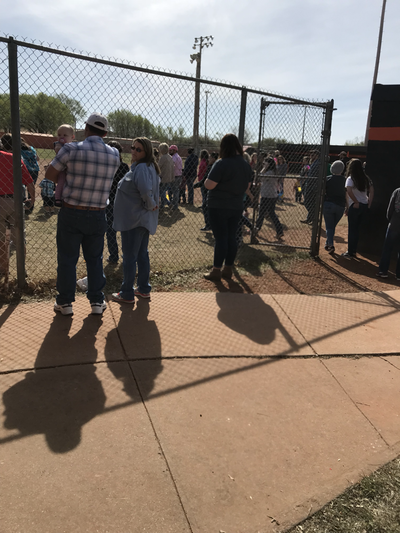 We appreciate all the support we received from the community, from business and individual sponsors to donors to people who attended the game to people who volunteered to help. The support was wonderful. 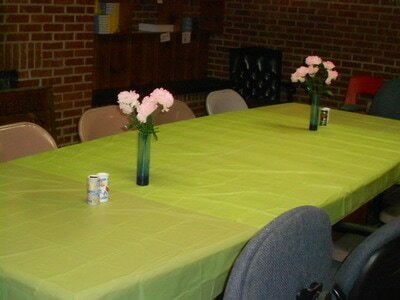 This was a big event for our small group and we were not sure we could pull it off. The support we received and the offers of help ensured the event did indeed happen and was greeted with much enthusiasm. 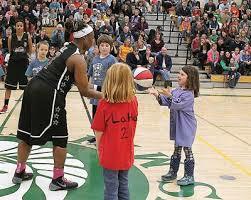 The Harlem Ambassadors presented a program at Cheyenne Schools on Friday afternoon. They presented a positive message to the kids. They told the kids that they have to work hard and sacrifice to achieve their dreams. Don’t believe the cruel things other people say to you. Other people can not define you. They shared stories of their own hardships as children and how they persevered through hard work, sacrifice and faith. The Chamber has a long list of people to thank. The game would not have been possible without the sponsors. A big thanks to our sponsors Security State Bank, Johnny Mcs, Western Oklahoma Tobacco Coalition, Roger Mills Memorial Hospital, Elk City First National Bank & Trust, Dale and Judy Tracy, Levingston Logistics, Dr. Steven Shrader, Rick and Carol Garrison, Northfork Electric, Hi-Pro Feeds, Jerry and Charlene Wilson, Kiwanis, Jerry’s Truck Stop, Dobson Telephone, Bear Trax Tires, York Insurance, Croton Creek, Barber Dyson Ford, Cheyenne Professional Drug, New York Life Jim and Frances Dearing and Randy and Cindy Malson. KECO Radio, Penny News, The Rock 94.3, Dr. Pepper Bottling Company, Bar S Foods and Clarion Inn of Elk City sponsored by donations. A huge thanks to all of them. A huge thanks to Creative Tees for the Roger Mills Roughnecks shirts. They made our team complete. . The Chamber also thanks donors Representative Todd Russ and Doug Gray Chrysler. 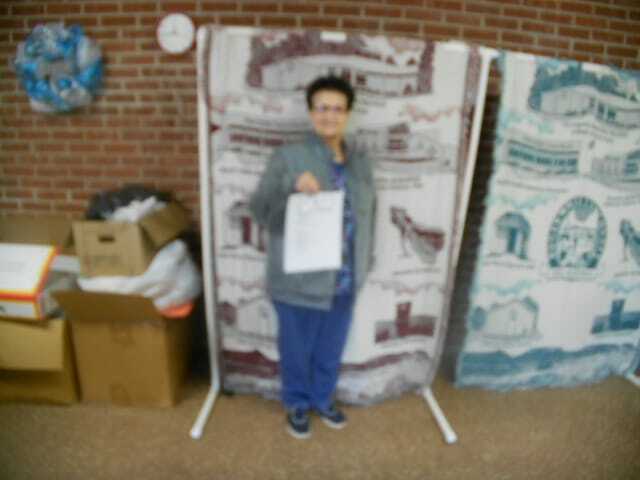 Thanks to Market Square, Roger Mills Memorial Hospital and Martin’s Trading Post for their donations. A lot of people came forward to volunteer their help. We couldn’t have done it without our volunteers. So a huge thanks to Rhonda Hensley, Toni and Bill Swartwood, Charlotte Nance, Roger and Lloydelle Lester, Kenny Atteberry, Jerry Wilson, Elma Clift, Billy Clift, Allie Clift, Kyle, Calista, Jantz, Kevin Bowles Mohr, Kathryn Harrison, Tucker Blythe, Vicky Miller and Richard Zahm . Cheyenne School went above and beyond to help us with everything. A special thanks to Rick Garrison for helping us make it all happen. We appreciate their support. The Ambassadors require the host to provide a dinner after the game. Linda Maddux did an amazing job getting the dinner together from getting donations to preparing the meal to serving it to the players. We appreciate all her efforts. We would like to thank the following donors to the dinner - Brittany Allen - Twisted Pearl Salon, Becky Buster, Melanie Cole - Cellular One, Cheyenne Star, Scott Martin - Martin’s Trading Post, Turley Ranch - Lori Sumpter, George and Flo Jean Whitehead, Cheyenne Baptist Church, Cheyenne Methodist Church and James and Linda Maddux. 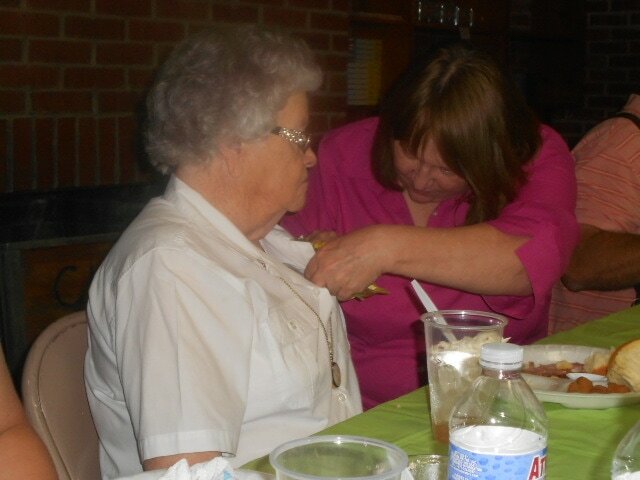 A huge thanks to the dinner workers - Cheyenne High School Honor Society Members, Carolyn Ford, Lisa Moorman, Pat Ver Steeg, Suzann Ver Steeg, Jan Howenstine, Tonya Roark and Linda Maddux. We owe a big thanks to our fearless team the Roger Mills Roughnecks. They were good sports and put on a great show. We were very proud of our players - Stuart Sander, Rick Garrison, Scott Martin, Ryan Baker, Lyndsay Bogges, Nikki Gourley, Nathan Brewer, J.R. Moler, Travis Goad, Rick Pearson,Riley Tracey,Ethan Smith, J.D. Powers, Jacob Cline, Shad Bogges, Chauncey Wesner, Devon Thrash and Janet Barton. To our fierce mascot, Denise Parman, much thanks. Never has there been a better Bear. To our two dancing referees, Nathan Torrance and Richard Megli a big thanks for being such great sports and entertaining refs. 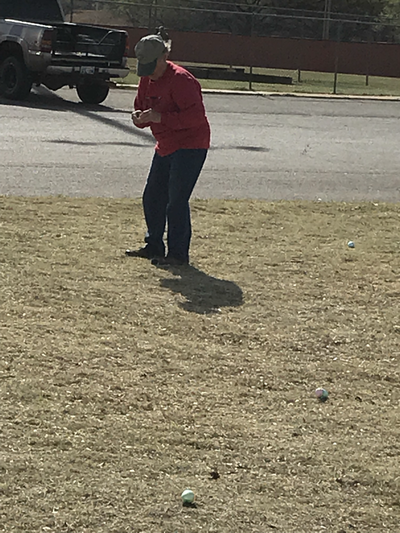 Thank you to John Smith for being our scorekeeper. Wes Isch for serving as our technical expert, we thank you. A big thanks to Neva Pyatt for all the work she put in on our behalf. Thanks to Melanie Cole and the Cheyenne Star for promoting the event. The Chamber would also like to thank Christine Calvert for singing the National Anthem and the Boy Scouts for performing the Flag Ceremony. The Chamber extends a big thanks to the City of Cheyenne for their support and help in all our efforts. Last but certainly not least thanks to our Chamber board workers. Cindy Clift for coordinating the entire event. She handled all communication with the Ambassadors and coordinated the Chamber responsibilities. Cindy obtained the concession stand goods as well as working during the game. Charlene Wilson, Penny Clift, Carrie Lovett, Pat VerSteeg, Jimmy Beavin, Linda Maddux, Nikki Gourley and Jo Nell York gathered sponsors, collected donations and worked during the game. 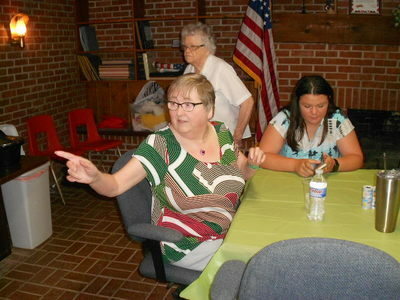 Pat served as host and guide for the Ambassadors team. A huge thanks to the Chamber Board. The Chamber is very proud to bring this quality family oriented event to our community. We are even prouder of the way the community stepped up to support our efforts. Thank you to everyone who attended. We hope you enjoyed the game. It was nine months in planning and we were so happy to see so many smiles in the crowd! If you enjoyed the game please visit our facebook page and leave a comment. 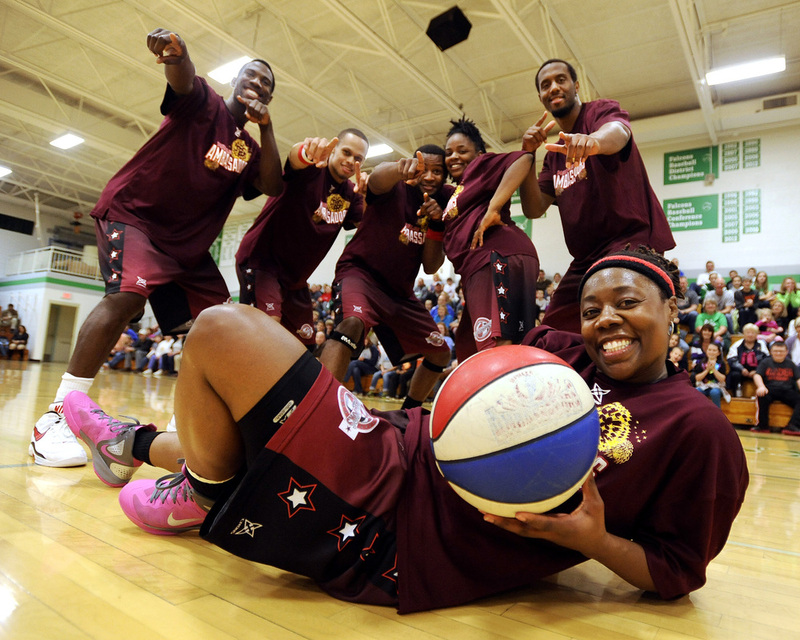 If you don't have tickets to the Harlem Ambassadors game, now is the time to get them! Advance sales end Friday at 4:00 p.m. Advance tickets are 10.00 for adults and 7.00 for students and seniors 65 and over. Tickets at the door will be 12.00 for adults and 9.00 for students and seniors. This is a big event for our small community. It is an evening of dazzling basketball, high flying dunks and comedy. Great for families. 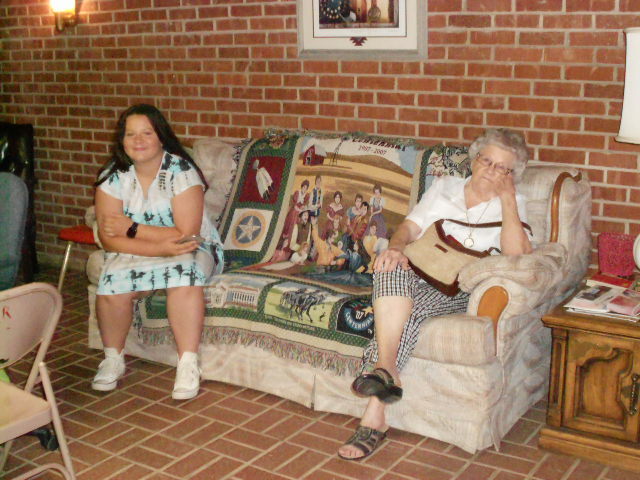 The young and the young at heart will enjoy the entertainment. Come and support our brave local team the Roger Mills Roughnecks. Cheer them on as they take on the Ambassadors. Beginning Friday, April 10th advance tickets must be purchased at Security State Bank. Sales will end at 4:00 p.m. After that time, tickets must be purchased at the door at the higher price. For more information contact Cindy at 580-497-3318. Come join us for the fun! The Easter Bunny turned up as promised on Saturday, visiting the Chamber of Commerce's annual Easter Egg Hunt in the City Park. 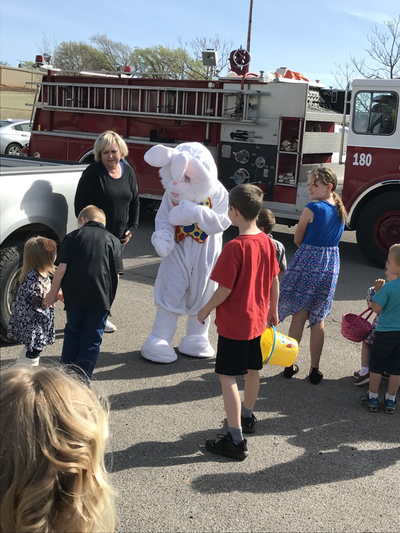 All the kids attending were very excited when the bunny rode in on the fire truck. 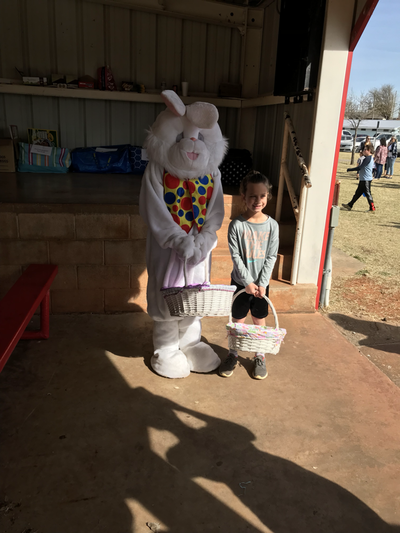 Mr. Bunny had a basket of candy with him. He handed out treats to all the eager egg hunters and posed for pictures. There was a good turn out for this year's hunt. 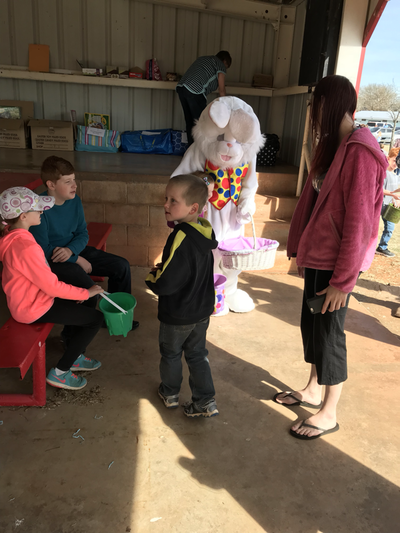 Lots of boys and girls enjoyed scooping up colorful eggs filled with prizes. 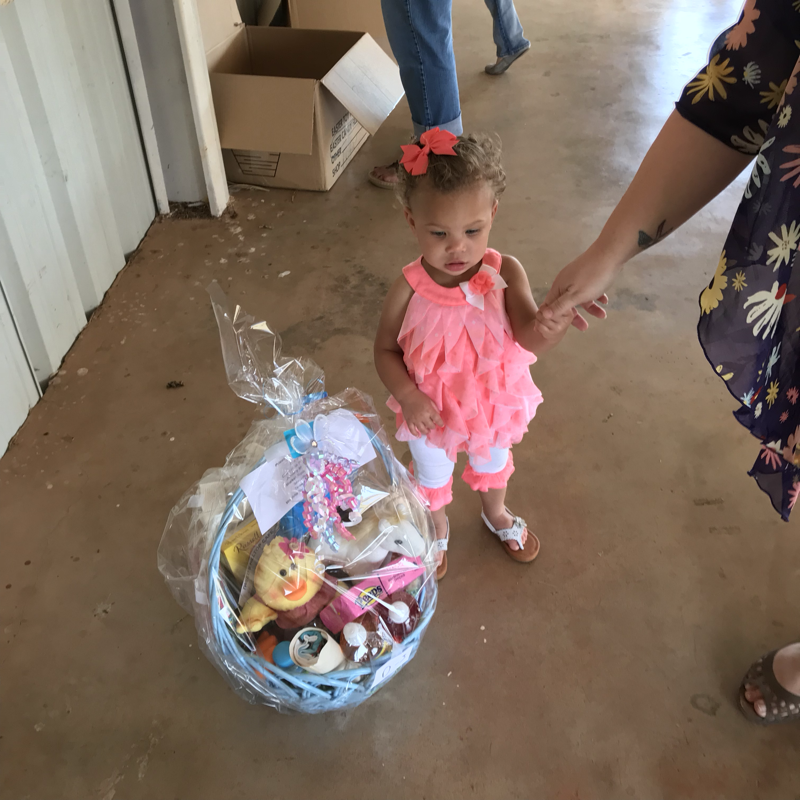 The eggs held candy or a prize. Prizes included books, kites, bubbles, stuffed animals, jump ropes, jelly beans, chocolate bunny money, Harlem Ambassadors tickets, coloring books, crayons, wildlife magnets, activity books, cupcakes, free pop and free candy bars. The grand prizes were Easter Baskets with a large plush Easter puppet,a big chocolate bunny and a bunny lollipop bouquet. The puppets were bunnies and one long haired sheep. The event was organized and coordinated by chamber secretary Cindy Clift. ​A Huge Thanks to Elma Clift for helping stuff eggs for a week.​ Thanks to Melanie Cole who took pictures of kids with the Easter Bunny. Thanks to the Cheyenne Fire Department for bringing the Bunny! The Easter Egg hunt wouldn't be the same without Olivia Lucas. A huge thanks to Olivia. 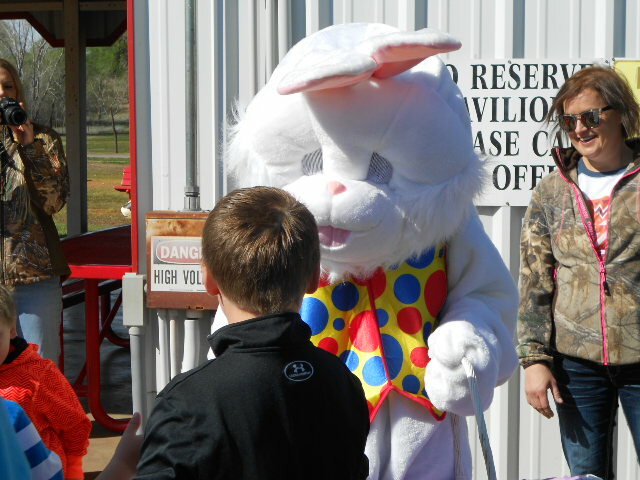 The Easter Bunny has put another year behind him, but he will be hopping our way again next Easter. We hope to see you next time. HARLEM AMBASSADORS ARE COMING YOUR WAY! ember 22nd. The show was full of fun food and unique items. 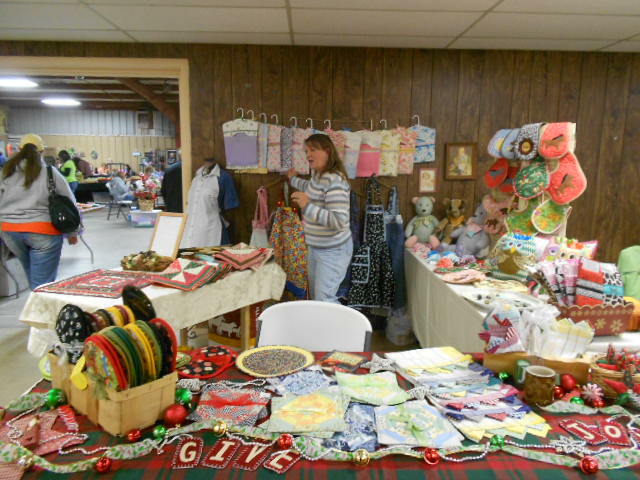 Shoppers found all kinds of treasures including handmade Christmas wreaths, jewelry, makeup, clothing, handbags, baby quilts, baked goodies, candles, toys, tshirts, wooden crafts and even balloon creations. There were too many things to list but they were all wonderful. 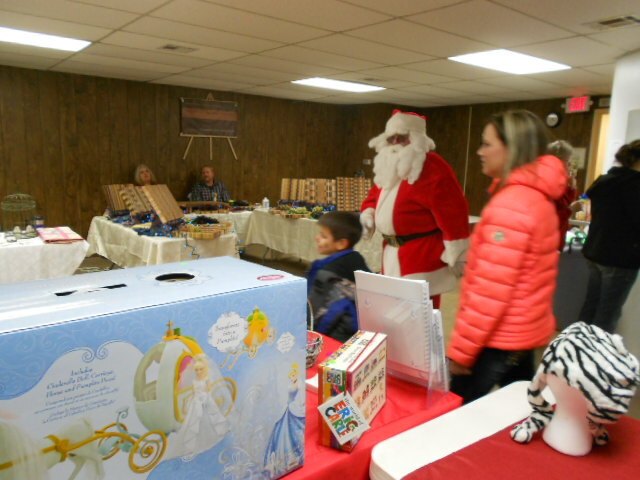 There were hourly door prizes, one for adults and one for children. 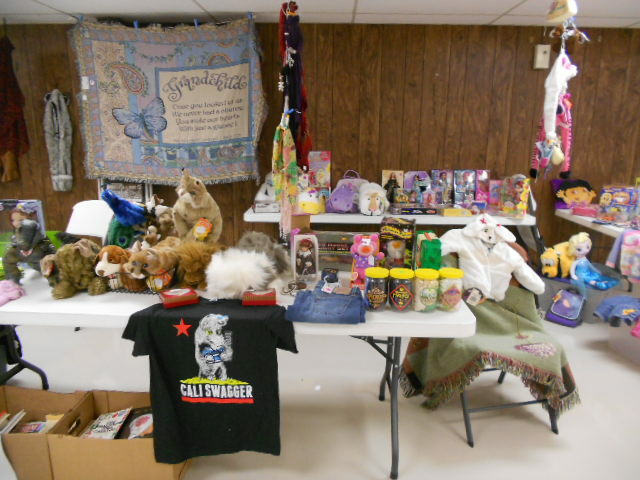 The prizes were donated by the vendors. We had lots of great prizes including a Scentsy Turkey, wooden Christmas decorations, jewelry, hand towels, handmade tiles, gift certificates, gold dollars and much more. 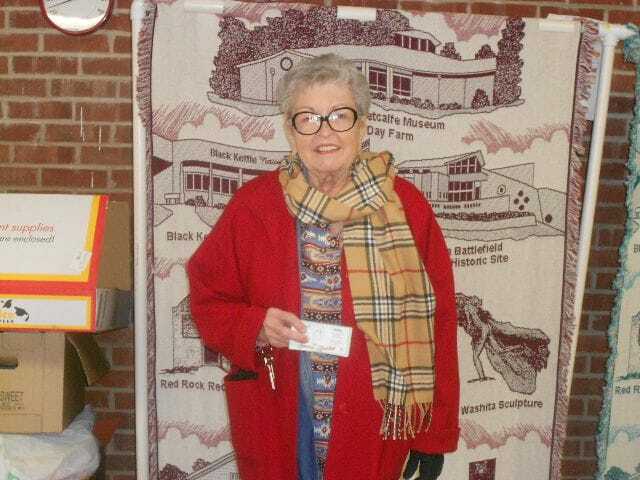 There were also hourly drawings to win a turkey. The turkeys were donated by Market Square. 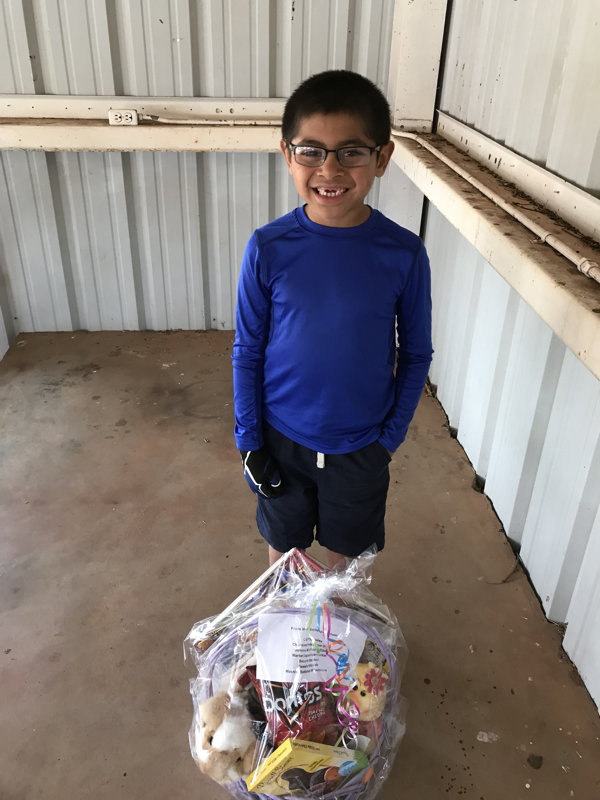 Ten lucky winners took home a turkey. Santa made a visit at 2:00 p.m. He talked to every child who came to see him. Everyone received a bag of treats. The Chamber also drew for the winner of the Huffy BMW. 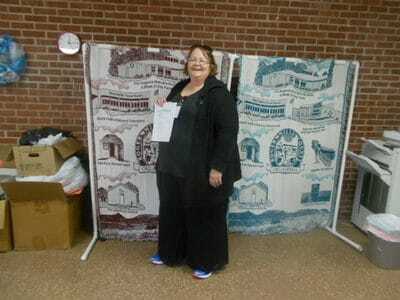 The lucky winner was Suzann VerSteeg. The concession served hamburgers, sloppy joes, baked potatoes, chili, frito pies and homemade desserts. Everything was delicious. 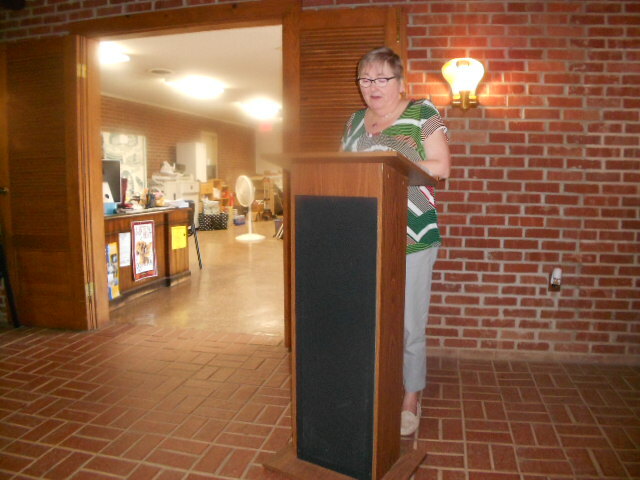 Our biggest thanks goes to Cindy Clift, her dedication and hard work make this event happen every year. The Chamber would also like to thank Security State Bank for donating the BMW and for their continual support of the Chamber. Thanks to Market Square for donating the turkeys and buns for the concession and Roger Mills Hospital for donating the hamburger. If you didn't attend then we hope to see you next year. If you did thank you and we hope you come back next year. The Annual Cheyenne​ Roger Mill Chamber of Commerce Arts & Crafts Show is this Saturday, November 22nd. This year's show if better than ever with lots of new vendors and tons of wonderful items! The show is held in the Roger Mills Ag Pavilion. The doors open at 9:00 a.m. and close at 4:00 p.m.
That is a few of the great things you will find! Bring your kids to the special kid's booth sponsored by the 4-H. Face painting and activities for the kids. There will be hourly door prizes​ and craft cash giveaway​. Register to win a turkey. 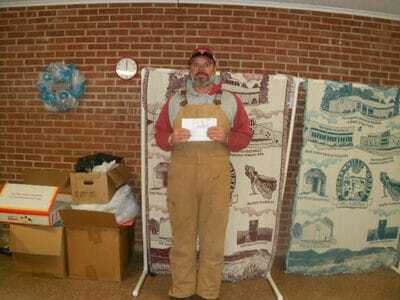 Turkeys will be drawn for along with the door prizes. Visitors can buy chances to win the Huffy BMW. The drawing for the BMW will be held at 3:30. Tickets for the Harlem Ambassadors vs Roger Mills Roughnecks will go on sale at the Craft Show. Treat your family! Great Stocking Stuffers! Santa will make an appearance at 2:00 p.m. to hand out treats. The concession stand will be serving Hamburgers, Sloppy Joes, Frito Pies, Hot Dogs, Baked Potatoes and desserts. Takeout is available just ask when ordering. Lots of great stuff at the Arts & Crafts Show! Unique gift items, fun and food! We are excited to have so many new and interesting vendors this year. It will be a great place to find that special and unique Christmas gift. Here is your chance to win a BMW! The only catch is your little one will have to drive. The Cheyenne Chamber of Commerce is selling chances on a Huffy BMW 6 Volt Ride on Battery Car. 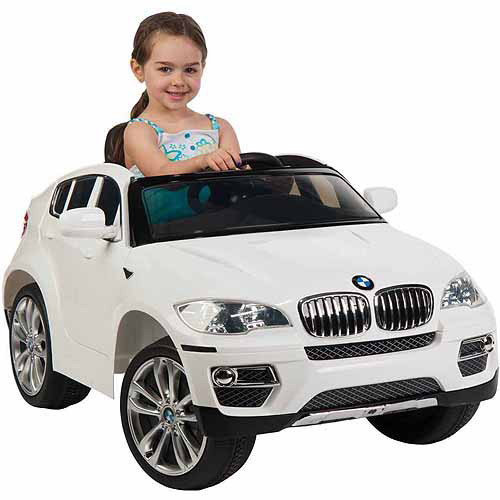 Your little one will be the cool kid on the block when they go cruisin in their BMW. Chances are 1 for $5.00, 3 for $10.00 or 10 for $25.00. 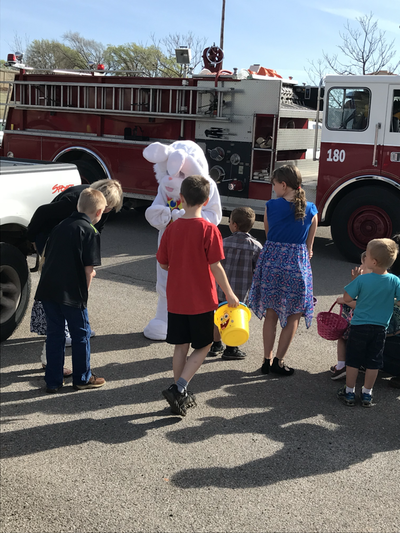 Chances are available at Security State Bank, Cheyenne Drug, Cheyenne Star, Martin's Trading Post, Cheyenne Floral, Twisted Pearl Salon, Jo Nell York, RM Courthouse from JImmy Beavin or Cheyenne Chamber of Commerce Office. Don't wait to get your chances! The BMW would make a great Christmas gift. 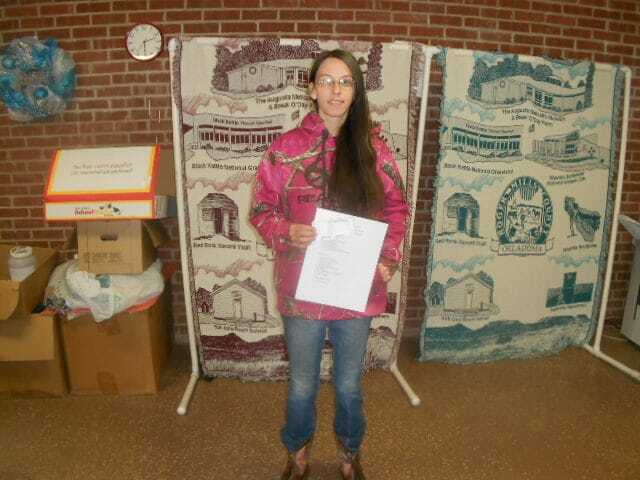 The drawing will be held at the Chamber of Commerce Arts & Crafts Show on Saturday, November 22nd. Chances will also be available before the drawing. The Chamber would like to thank Security State Bank for providing the BMW. Winner is responsible for picking up the prize. For more information contact the Chamber office at 580-497-3318. Check our facebook page for all the upcoming chamber events! Get your decorating hat on and get busy. There will be a first prize awarded for best decorated residence. There will also be a first prize awarded for best decorated business. The theme can be Fall or Halloween. 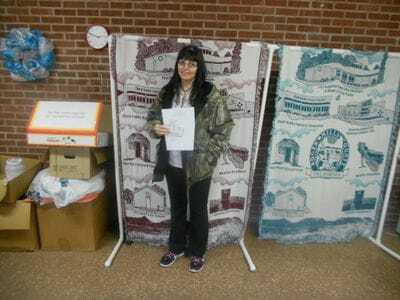 The first place residential winner will receive $50.00 in Craft Cash, which can be spent at the Annual Chamber Christmas Arts and Crafts Show on Saturday, November 22nd. All entrants must​ sign up and ​ get a number to be displayed along with their decorations. Numbers are available at the Chamber Office or Security State Bank during business hours. 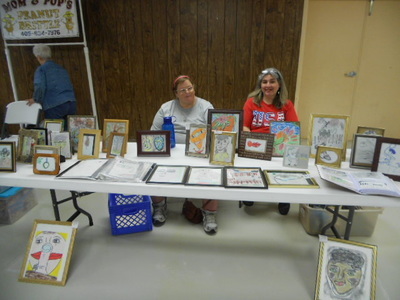 ﻿They Cheyenne Chamber of Commerce Annual Arts and Crafts Show will be held on Saturday, November 23rd. We are currently looking for vendors who want to help us kick off the Christmas shopping season. 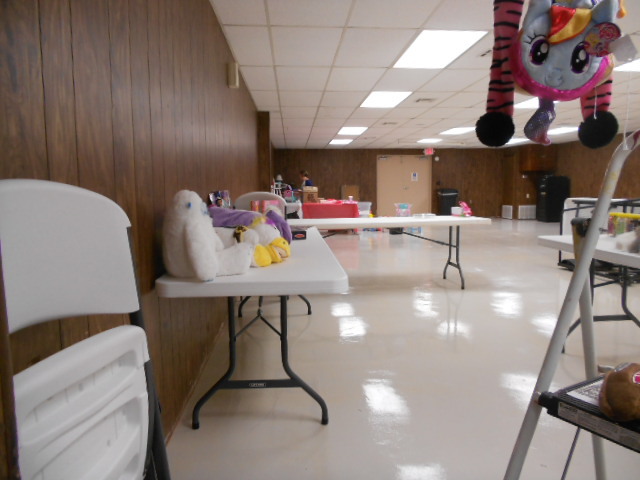 Booth rental is 35.00. Booths are 8'x10'. 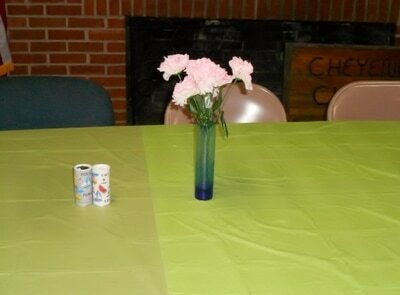 The Chamber provides one table and two chairs. There will be a concession stand serving delicious homemade food. 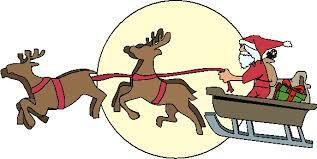 Santa will make a visit to hand out candy and visit with the children. There will also be door prizes, special kids prize drawings and a kids booth where the kids can have their face painted and play games. The Chamber does extensive advertising in order to make our show successful. 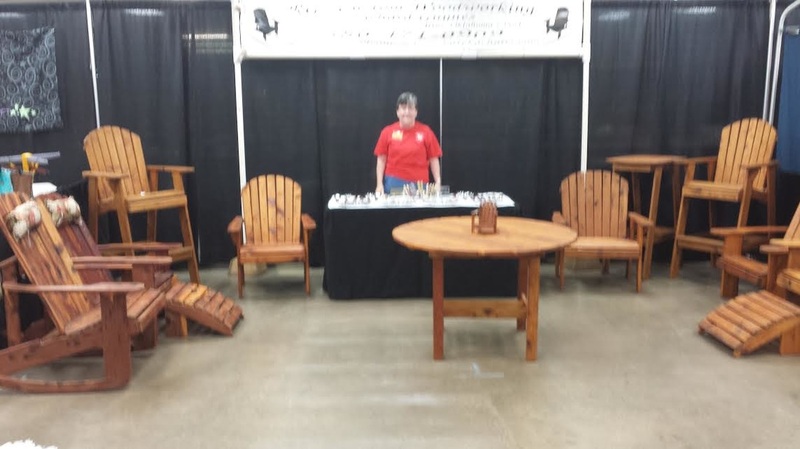 If you would like to bring your special product to our show, reserve your booth today! We always have a waiting list so reserve early. 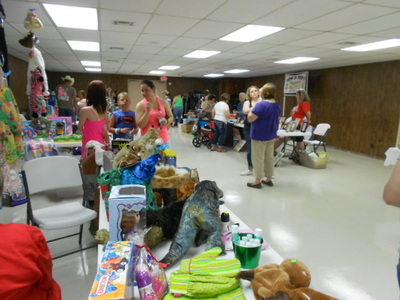 The Cheyenne Chamber of Commerce Flea Market and City Wide Garage Sale Event was a huge success. We had visitors from far and near! 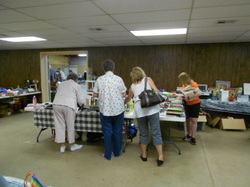 Everyone had a great time browsing through all the treasures at the Flea Market. 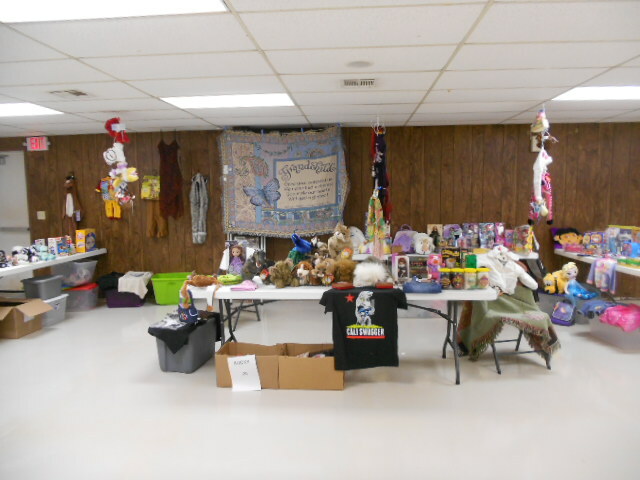 There were so many wonderful items! 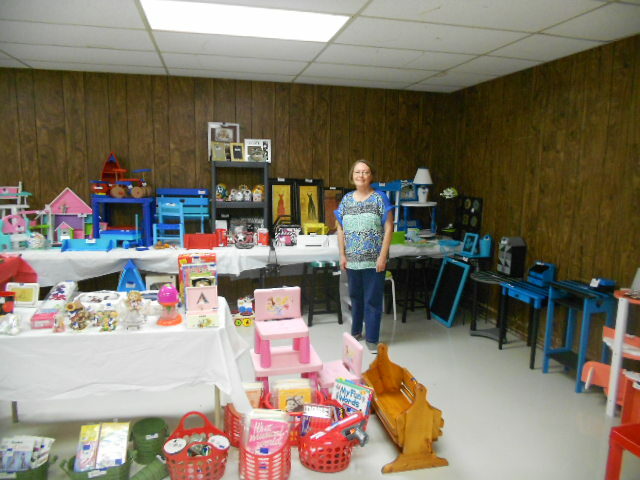 The show featured jewelry, toys, throws, decorated flip flops, books, wooden saddle racks, home decor, wooden crosses, framed pictures, tote bags made from feed sacks, hand sewn aprons, baked goods, clothes, afghans, shoes, Avon product, Stanley products and the list goes on. The concession served hamburgers, hot dogs, baked potatoes, chili and desserts. Everything was delicious! The crowd enjoyed the great food in a cool atmosphere as they shopped through the booths. The Chamber would like to thank Security State Bank for sponsoring our advertising and Market Square and Roger Mills Hospital for donations to the concession. 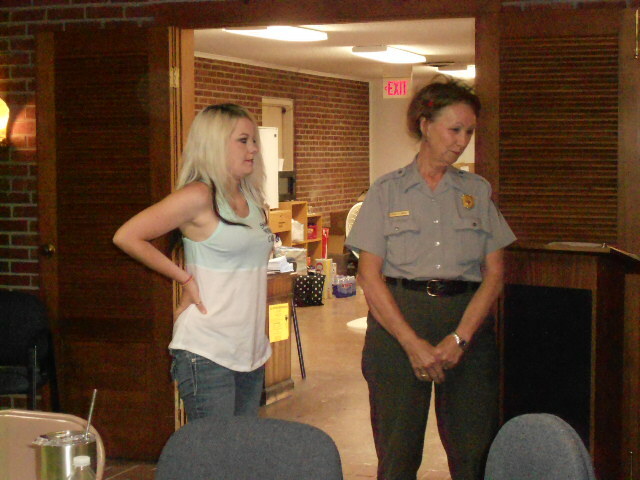 Thanks to Cheyenne Star and Melanie Cole for her wonderful help in promoting all our events. We greatly appreciate all our business member support. A huge thanks to Jason Beasterfeld for helping with set up and clean up. He is our muscle man! We would like to thank our set up crew Darla Beasterfeld, Jason Beasterfeld, Penny Clift, LInda Maddux, Jordan Parman, Carrie Lovett and Cindy Clift. 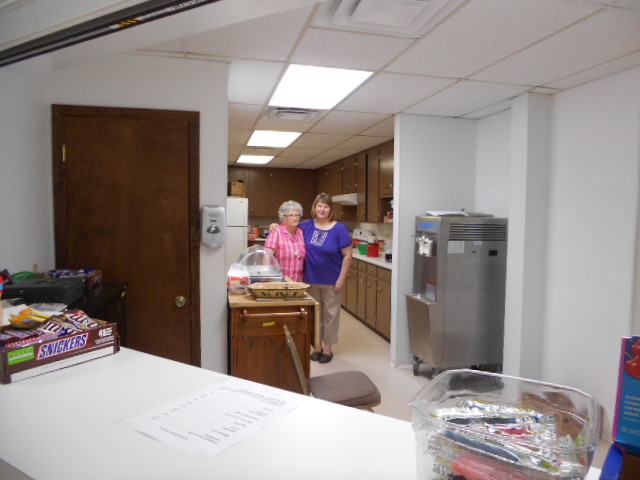 A big thanks to Judy Tracy, Janith Moore, Carrie Lovett, Linda Maddux and Carol Mapel for making delicious desserts for the concession. A big thanks to Carrie Lovett for being commander in chief of the concession stand. Also thanks to concession volunteers Linda Maddux, Janith Moore, Darla Beasterfeld and Charlene Wilson. 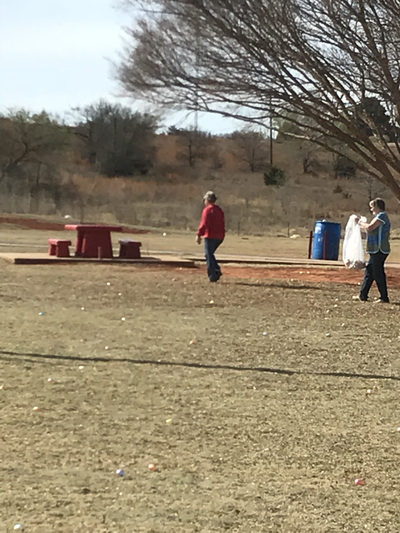 Our clean up crew consisted of Jason Beasterfeld, Jamie Beasterfeld, Darla Beasterfeld, Penny Clift, Cindy Clift and Charlene Wilson. Big thanks to the crew! And last but not least a big thanks to the vendors who made our show a success. The uniquely wonderful items offered made the Flea Market a shopper's joy! And let's not forget everyone who turned out to support the event. We appreciate community support as we try to provide community events that are family friendly and enjoyable for everyone in our area. The chamber appreciates everyone who comes out to support all our hard work! 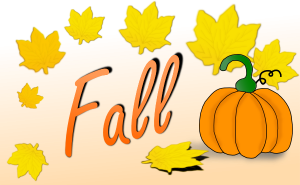 The next big Chamber of Commerce events will be the Fall Decorating Contest, T-Shirt Design Contest and the Christmas Arts and Crafts Show. 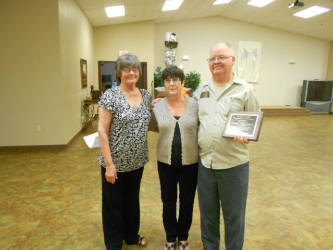 The Cheyenne Roger Mills Chamber of Commerce hosted the Volunteer of the Year Luncheon on Thursday, May 8th. This year's recipient was George Whitehead. 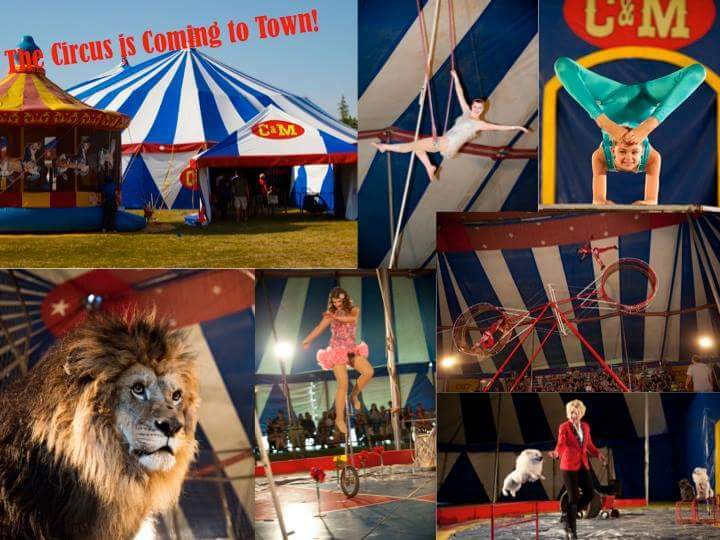 Big Top Circus is Coming to Town! Thanks to the sponsorship of The Cheyenne-Roger Mills County Chamber of Commerce, Culpepper & Merriweather Circus, America’s Favorite Big Top Circus is coming to Cheyenne, Oklahoma at the Cheyenne City Park with two scheduled performances at 5:00 & 7:30 p.m. Now in its 29th edition, C&M Circus has become internationally known for quality family entertainment. This authentic One-Ring, Big Top Circus has been featured on National Geographic’s Explorer TV series, Entertainment Tonight, The Los Angeles Times, The Chicago Tribune, Arizona Highways Magazine. It has also been featured on the A&E Special: Under the Big Top and most recently, On the Road with Circus Kids, a Nickelodeon special featured on the Nick News Program. In recent years the Tent Raising and Morning Tour has become a popular program for families and interested community members. 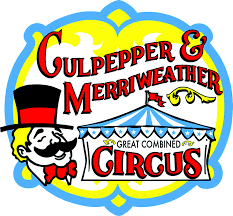 It is presented in a way everyone, young and old can learn many interesting facts about the Culpepper & Merriweather Circus Family and now we have a brand new tent! This is a special part of Circus Day that should not be missed. On circus day, our performers bring the magic of the circus to life in each 90-minute show. This year’s lineup includes an All-Star group of performers and entertainers that include: Miss Simone and her amazing single trapeze, Miss Paulina’s proud prancing ponies, The Arlise Troupe on their wild and crazy unicycles, Natilie’s American Eskimo Escapades, The Ayala’s with unforgetable foot juggling, a rediculas Rola Bola and certainly a hair raising Hair Hang! But, lets not forget our favorite performing Jungle Cats, Soloman, Delilah & Francis, presented by Mr. Trey Key, that will certainly have you on the edge of your seats! All with original music written by the talented, Matt Margucci from Los Angeles, California. Our performers are sure to amaze, delight and entertain the audience members of all ages beyond your wildest imagination. The costumes alone are certainly of Los Vegas quality. SAVE MONEY by purchasing your tickets in advance at these locations: Roger Mills Memorial Hospital, Cheyenne Professional Drug, Fabulous Fabrics & More, Security State Bank-Cheyenne • Hammon, York Insurance, Martin’s Trading Post, Jimmy Beavin and Cheyenne Roger Mills Chamber. 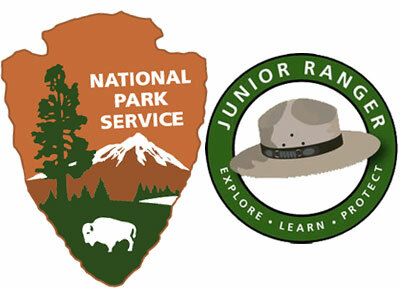 Prices for advance tickets are $6.00 for children ages 2 to 12, children under 2 are always free, and $10.00 for adults. On show day tickets will be $13.00 for adults and $7.00 for children. Buy your tickets early and save. For more information or to purchase discoutnt tickets with a credit card call 866 BIG TOP 6. The Circus is coming to town! Thanks to the sponsorship of The Cheyenne Roger Mills Chamber of Commerce, Culpepper & Merriweather Circus, America's Favorite Big Top Circus is coming to Cheyenne, Oklahoma on Friday September 20th in the Cheyenne City Park with two performances at 5:00 and 7:30 p.m. Now in its 29th edition, C&M Circus has become internationally known for quality family entertainment. This authentic One-Ring, Big Top Circus has been featured on National Geographic’s Explorer TV series, Entertainment Tonight, The Los Angeles Times, The Chicago Tribune, Arizona Highways Magazine. It has also been featured on the A&E Special: Under the Big Top and most recently, On the Road with Circus Kids, a Nickelodeon special featured on the Nick News Program. Save money by purchasing your tickets in advance. Tickets are available at Cheyenne Professional Drug, Security State Bank Cheyenne & Hammon, Fabulous Fabrics & More, Roger Mills County Hospital, York Insurance-Durham, Jimmy Beavin & The Chamber Office. Prices for advance tickets are $6.00 for children 2-12, children under 2 are free, and $10.00 for adults. On show day tickets will be $13.00 for adults and $7.00 for children. Buy your tickets early and save. The Cheyenne Roger Mills Chamber of Commerce is putting together a new cookbook. 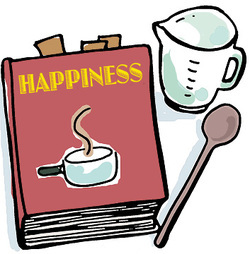 This book will be a combination of recipes and crafts. We hope to make it one that will be handed down from mother to daughter. 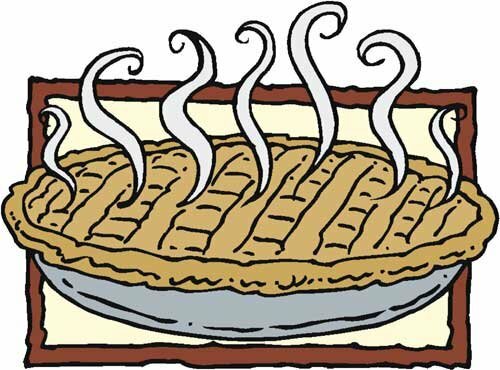 The Chamber invites you to share your special recipes. Include your family memories along with your recipe. There will also be a craft section of the book. If you have a craft you would like to share, we would love to include it in the book. Something passed down from your grandmother or something new you have created yourself it is all welcome. Include a picture if you like. We prefer a typewritten submission but if that is not possible please submit a legible copy to ensure we get everything correct. Thank you. 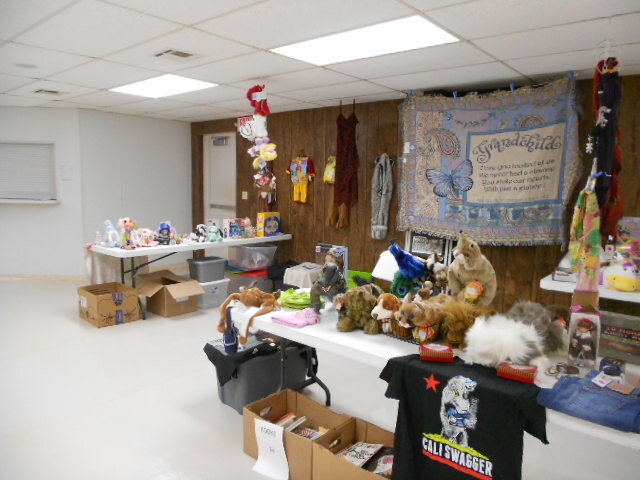 Send your items to Cheyenne Chamber of Commerce, Box 57, Cheyenne OK 73628. For more information contact the Chamber office at 580-497-3318. We look forward to sharing your special memories. The Cheyenne Roger Mills Chamber of Commerce Citywide Garage Sales were held on Saturday, June 8th. Lots of shoppers turned out to browse the bargains. 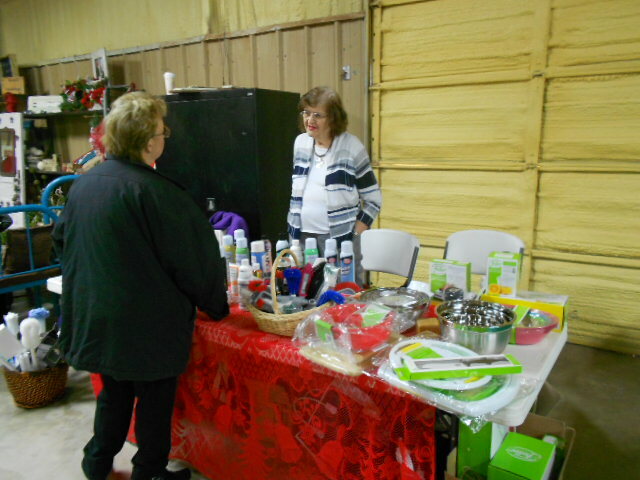 Along with sales in town there were also booths in the Ag Pavilion. 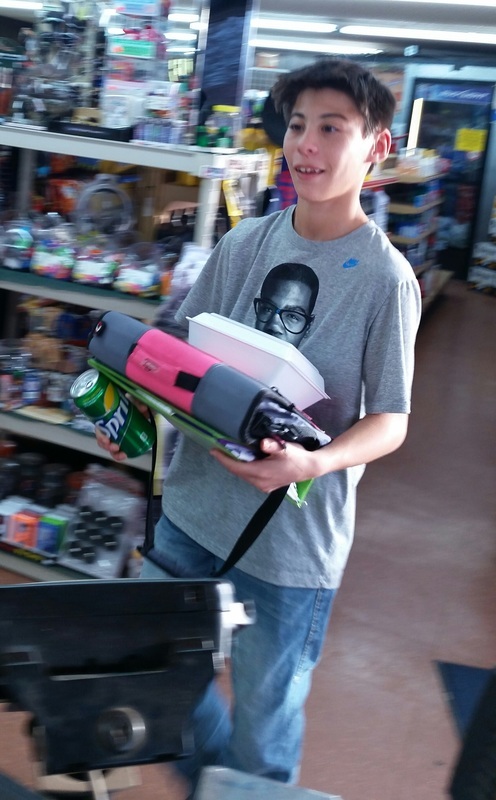 Shoppers found a variety of items in the booths. Everything from clothing, toys, tools, bedding, home decor to knives, games, movies, silverware and even a weight loss system. There really was something for everyone. The concession stand served lots of hungry shoppers. 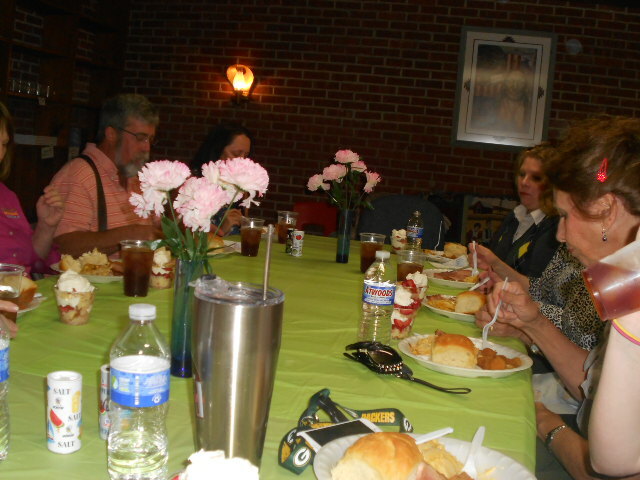 There were Sloppy Joes, Frito Pies, Baked Potatoes, Hot Dogs and Homemade Desserts. 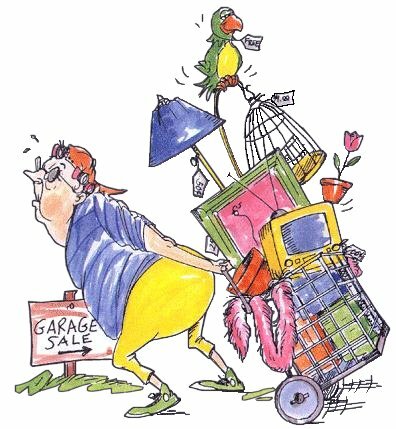 The Chamber would like to thank everyone who rented a booth and all the volunteers who helped make the Garage Sales a success. A big thanks to Elma Clift who made the Sloppy Joes as well as worked in the concession stand. 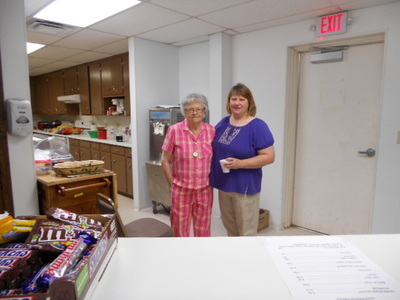 Thanks to concession stand workers Darla Beasterfeld, Pat Ver Steeg, Charlene Wilson, Penny Clift and Cindy Clift. 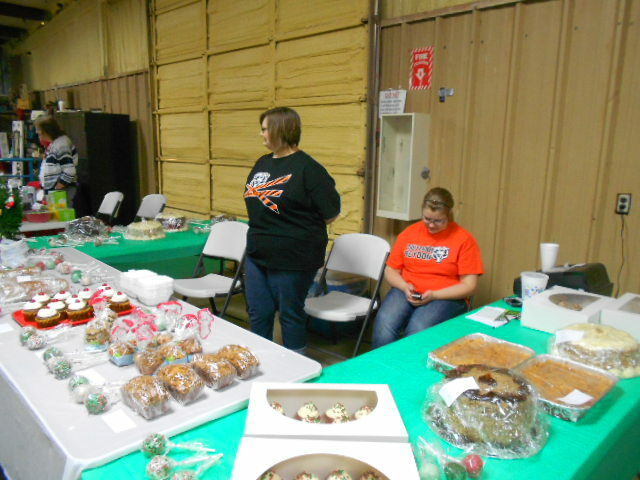 Another big thanks to those that brought the desserts - Carrie Lovett, Linda Maddux, Rhonda Key and Judy Tracy. A big thank you to Jason Beasterfeld for all his help. The Chamber would like to thank the businesses and individuals that donated items to the concession stand. Thanks to Martin's Trading Post, Johnny Mc's Food N Fuel, Market Square, Cheyenne Professional Drug, Roger Mills Memorial Hospital and Charlene Wilson. Now that the Garage Sale event has came and went the Chamber is preparing for the year's next big events. There will be a circus in September and the Annual Arts & Crafts Show in December. So watch the paper for details on these events! 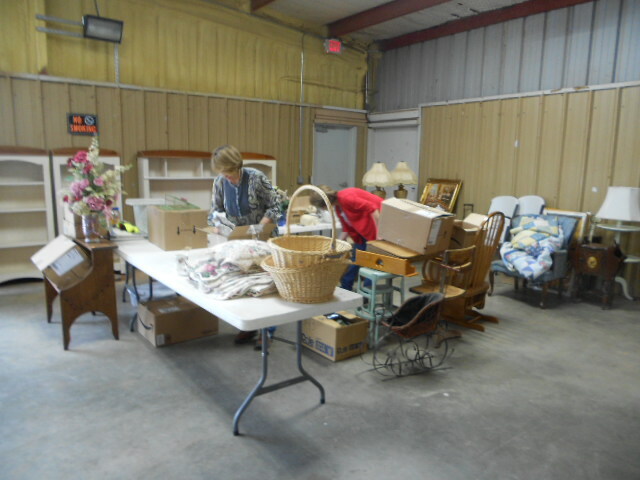 Visit the Chamber of Commerce Facebook page to see pictures of the Garage Sale event. 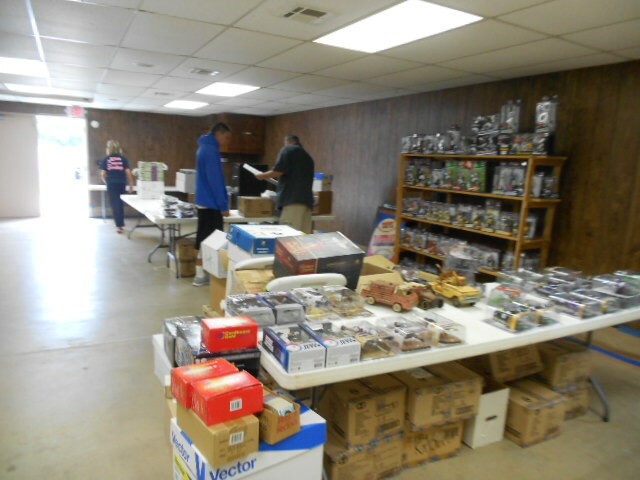 We would like to thank everyone who turned out for the Garage Sales. We hope to see you at the Arts & Crafts show! For more information on any of these events contact the Chamber at 580-497-3318. See you soon! Check out pictures from the garage sales below! Chamber Annual Easter Egg Hunt a Success!